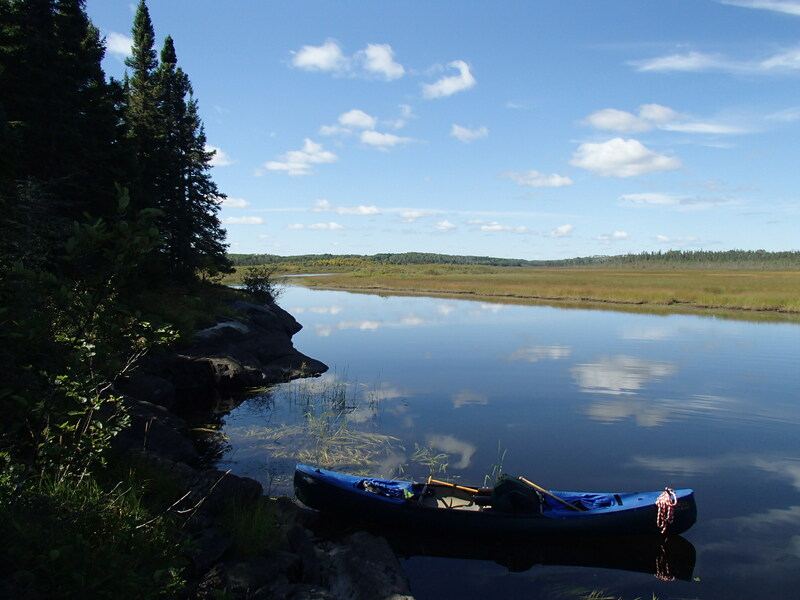 Archive by category "Canadian Canoe Trips"
The Marshall lake loop in low water. 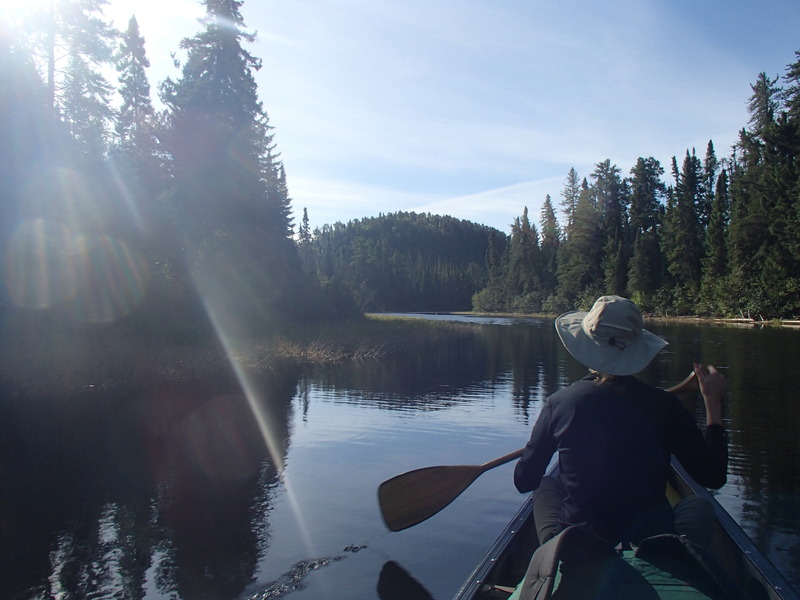 Our annual canoe trip took us back to the Nakina region of Northern Ontario. 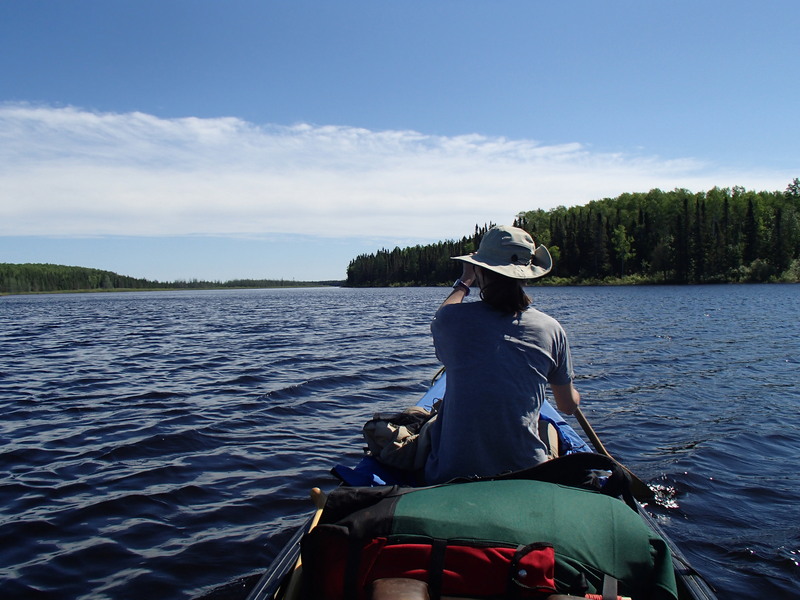 Our initial plans were for a longer trip, but after seeing the water levels during the first part of the trip we decided to instead paddle the Marshall Lake Loop, which we had paddled in the spring of 2012. Our original plan would have taken us down the Lower Kap and up Meta Creek. We decided that the Lower Kap would be best enjoyed with more water, and Meta Creek could be a slog with no water. We started our trip around 9am on day one, after about a 35min drive from the town of Nakina. 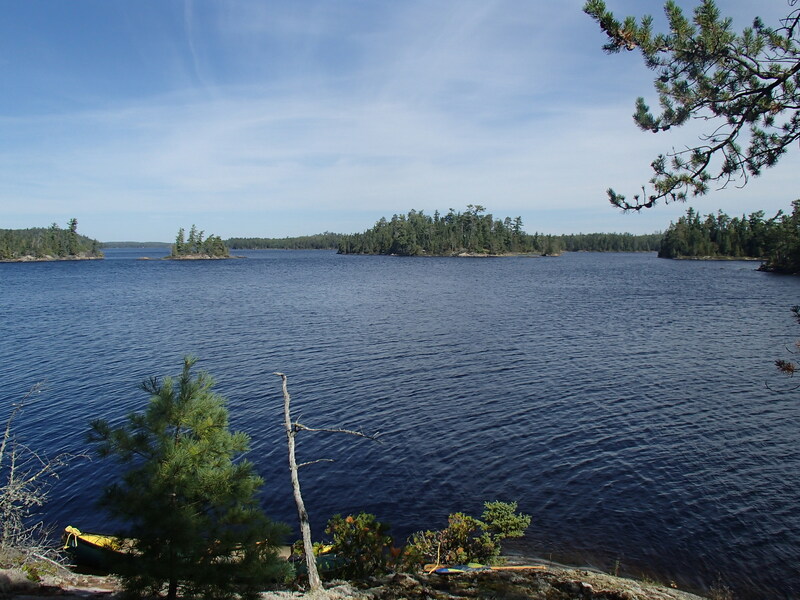 The first portage to the lake is long but easy. The sides of the trail where filled with blueberries, which were already long gone back in Minnesota. Our weather was overcast and cold, but fairly calm. 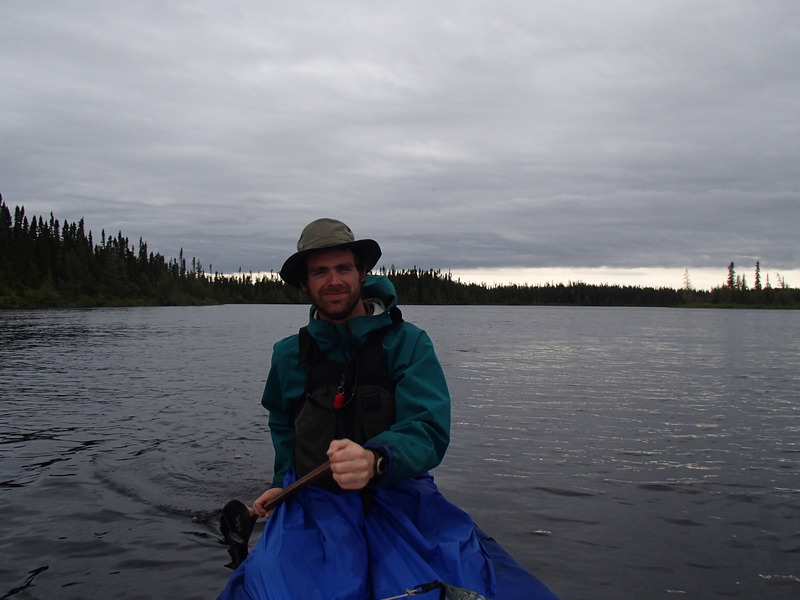 We enjoyed paddling Marshall lake, and exited at the mouth of the Gripp River. 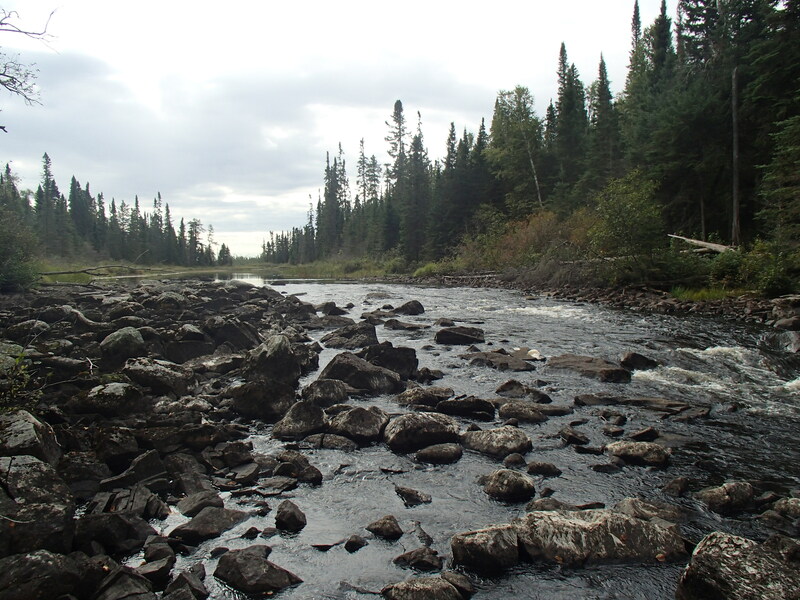 The Gripp River is rocky and beautiful. We immediately started to see signs of the low water, as the river was rarely more than a few feet deep. In places we nearly ran out of water and had to push through thick vegetation. After a couple portages we approached Gripp Lake. 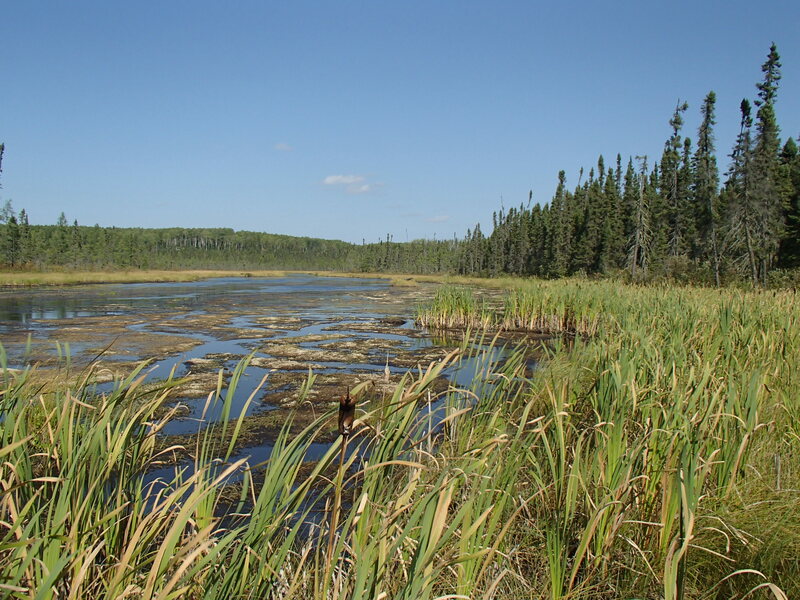 We were met with a wall of wild rice and shallow water. We ended up pushing through to a small island and then carrying over it to get to open water. We had a nice paddle down Gripp, and were treated to a few small patches of blue sky. The section between Gripp and Summit proved challenging. Again we were dealing with sometimes mere inches of water, with a muck bottom. We frequently had to stand to see above the rice to decide our best course. Once on Summit Lake we had a wide but weaving channel through the rice, which eventually opened up and allowed us to cross the lake to a campsite on the west shore. It was a very nice site, with lots of room to spread out. The next day started with more shallow water. None of the rapids were runnable, but we were able to line and drag down some. By lunch we were at the falls on the Powitick. The falls were beautiful, but less impressive than they were in 2012. Once we were on the Kap we had more water to deal with. All of the rapids still required lining or portaging. I had the old fall canoe trip chorus of “hey this would be fun to run in the spring” running through my head. 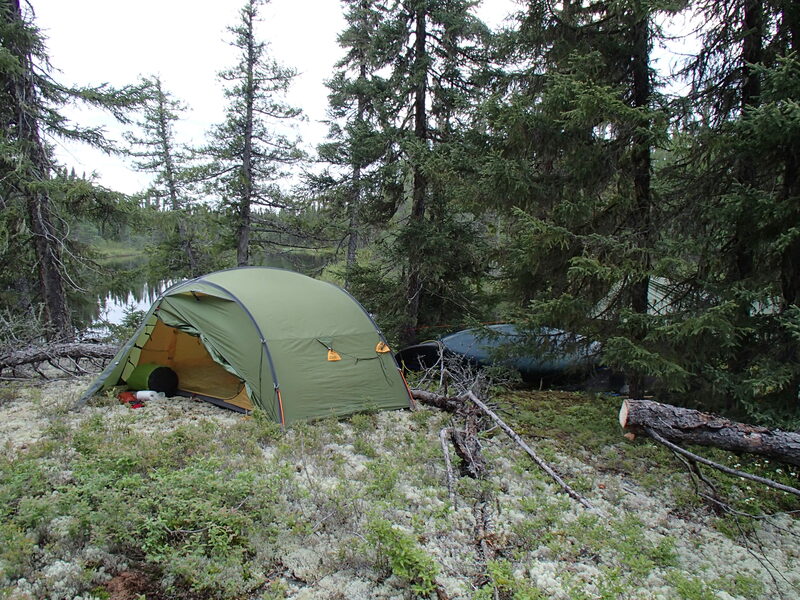 We tackled the last few portages, and made camp on the last portage before the bridge. The next day was a long one. The Kap was wide, and there were no portages or rapids to negotiate. The day was fairly warm and sunny. During the day we decided not to try the Meta Creek route, and instead do the shorter loop. We ate lunch on a rock outcropping, and otherwise just paddled. We made it to Stewart Lake around 3:30, and set up camp in a nice rocky bay. We enjoyed lounging around watching the sun go down. At night, I we discovered that one of our sleeping pads had popped. I was able to find and patch one small hole, but the pad continued to leak. I was able to sleep, but was a bit stiff getting up. The wind had picked up the next day, and we had a strong head wind on Stewart. We made it to the small channel between Stewart and Stone, and again had shallow water to deal with. 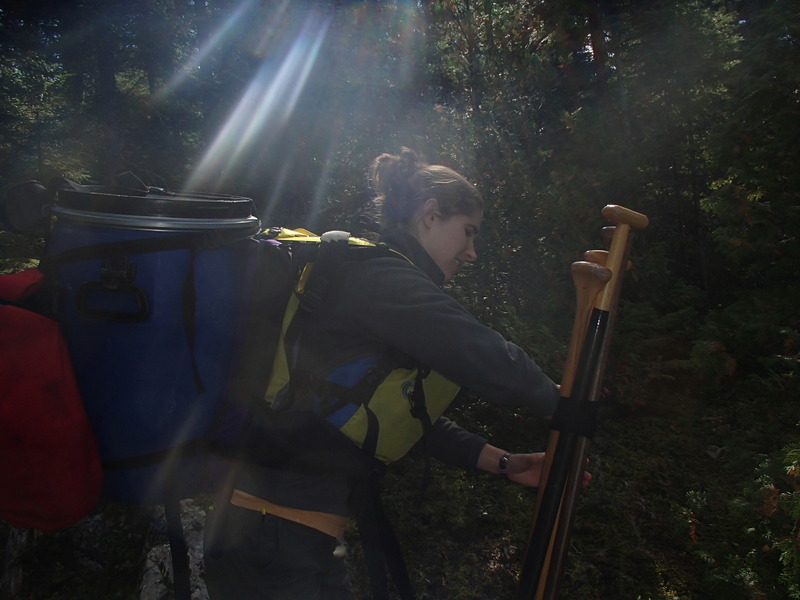 We waded a lot, and used one short portage. Stone lake was full of whitecaps. We inched our way up the west shore to the campsite and ate lunch. We determined we were wind bound, and stayed the night. 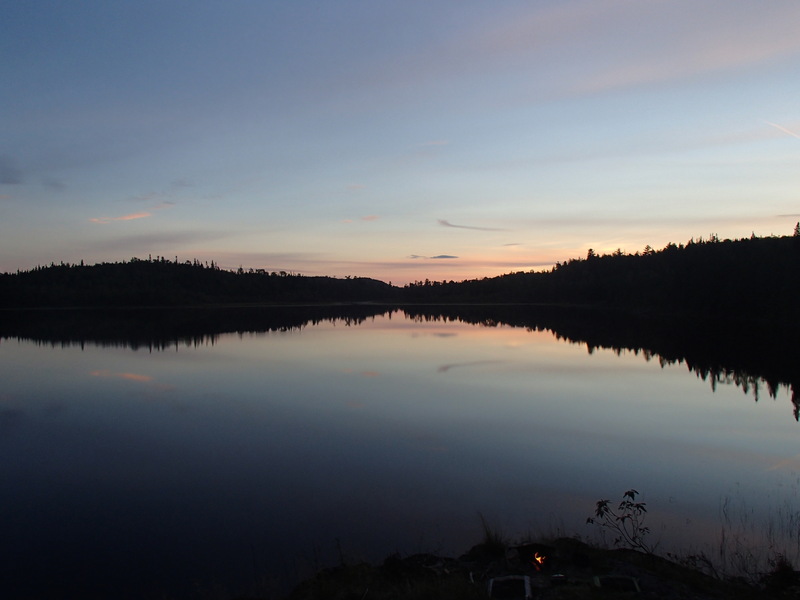 Having camped here in 2012 we knew it was a very nice site. We read and swam and kept ourselves occupied until bed time. I patched another hole in the mattress, but again only slowed the leak. I removed the foam padding from my pack and slept on that and some extra clothes and was comfortable and warm. We woke up at 5am and packed up to try and beat the wind for the Ara Lake crossing. The Stone to Ara port was a bit brushy, but so much easier than last time we did it, when it was so wet we would sink in to our waists. The wind was still light when we crossed Ara. At the point near the Arameta Channel we ate breakfast. Meta was hard going. The wind had picked up considerably, and we inched along. Once off the main part of the lake, we were able to make it about ¾ of the way up the creek to the last portage before it dried up. 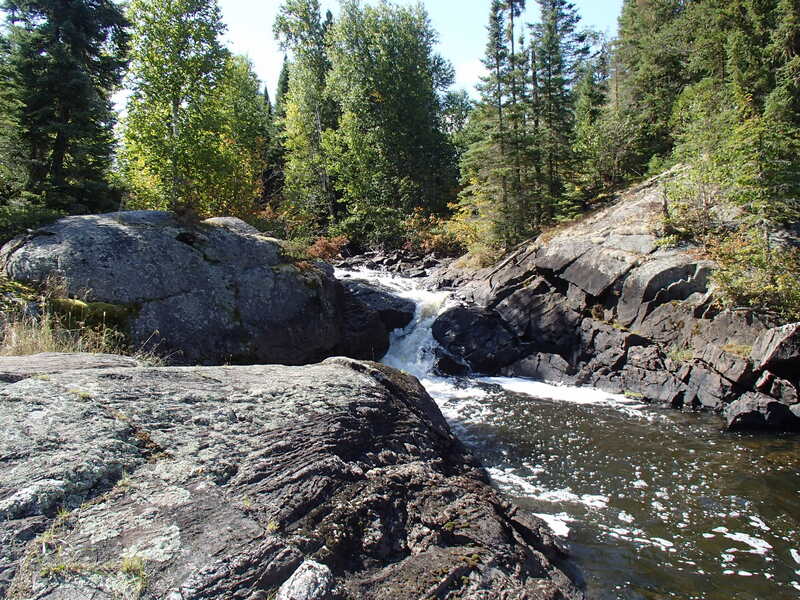 We carried along the edge of the creek until we hit a trail that eventually hit the main portage. The portage was dry and easy to follow. There were short sections of blow down, and some fairly brushy parts. I was pretty tired and took 5-6 breaks. Kate was less tired, and made sure the breaks were very short. We finished at the road and loaded up. We drove to Nakina to get some gas and snacks, and then headed towards Nipigon for the night. On the way out of Geraldton I was pulled over by a Conservation Officer who asked to see my crownland camping permits. Kate had them in her pocket, and we were on our way. Good to know that you can get checked. 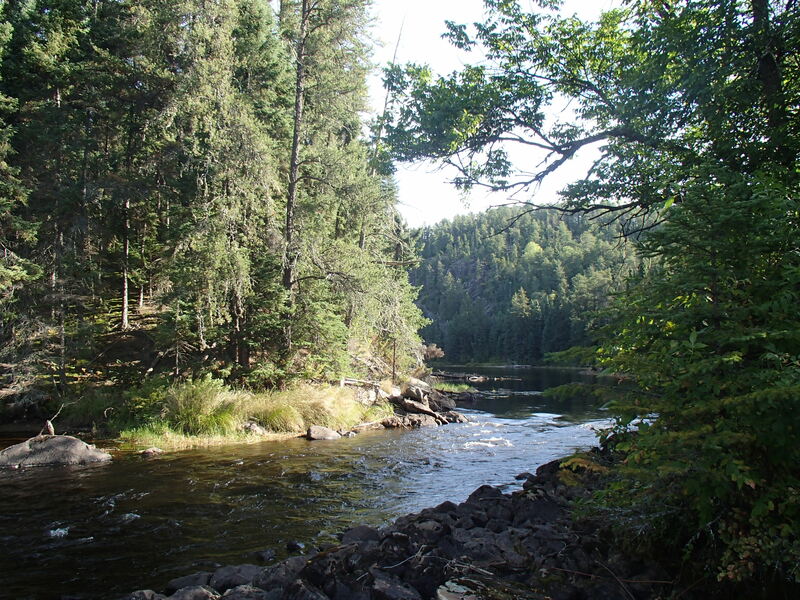 A Canadian wilderness river, right in our backyard. 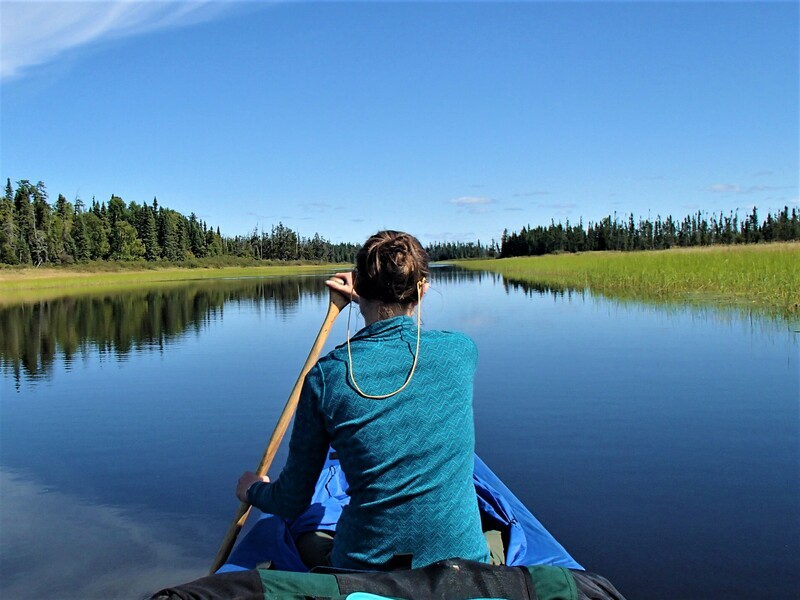 This September Kate and I paddled the Weikwabinonaw River, in Ontario. 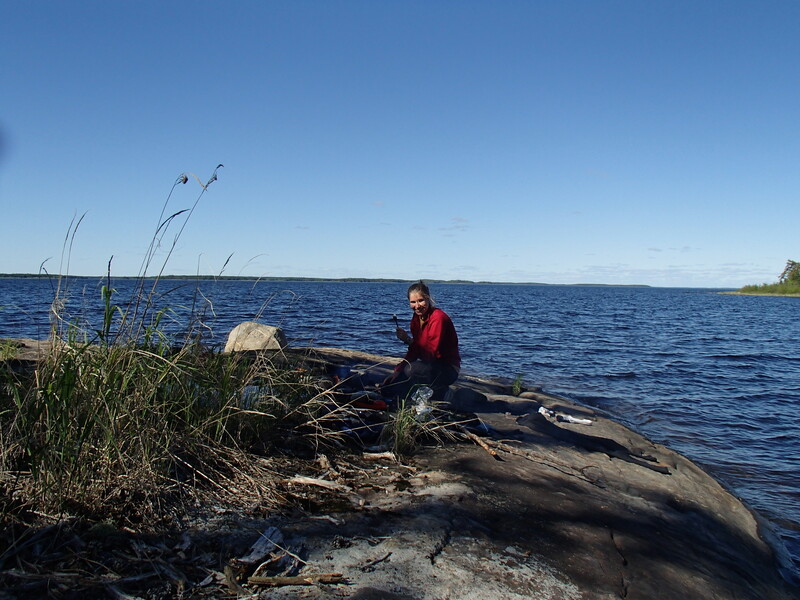 The Weikwabinonaw has intrigued me for years, due mostly to its closeness, but I had never been able to find any good information about it. 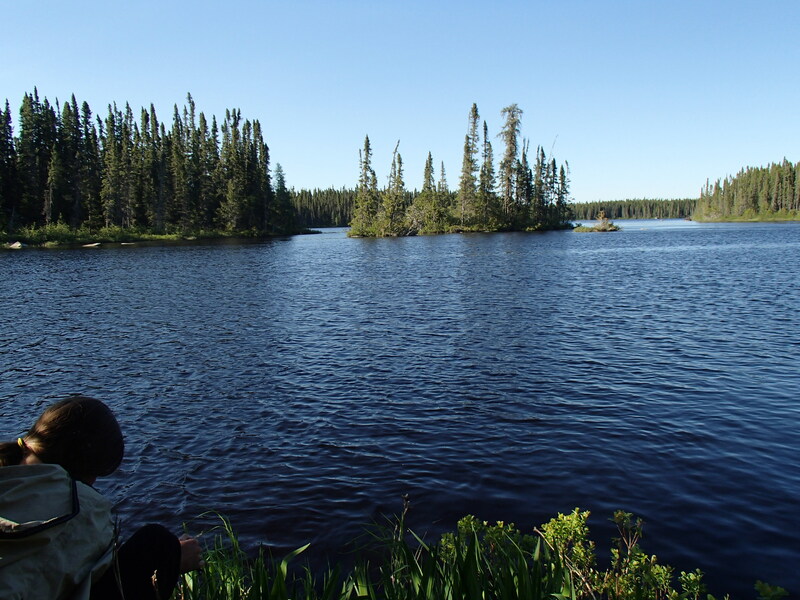 Since we did not have time this spring for our usual Canadian river trip, we thought we would take the short drive to the Northern Light lake area and give the Weikwabinonaw a try. The river wildly exceeded my expectations. 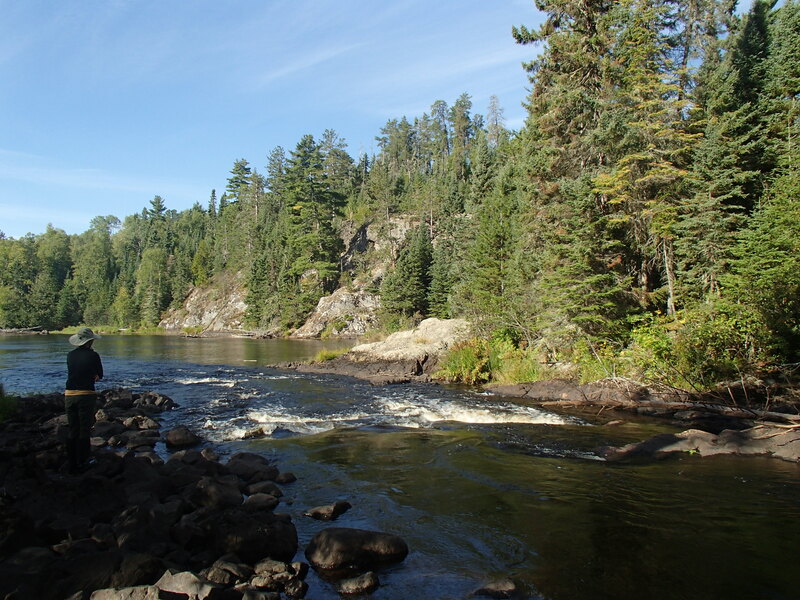 The river itself was very scenic, with beautiful rapids and rocks. Portages were in good shape, rougher than most BWCA/Quetico Portages, but much better than many farther north portages we have done. In the last few years I have come to believe that that the best way to enjoy a trip is to do enough planning to make sure the trip is safe and feasible, and not much more. Why spend your time looking at someone else’s photos of the campsites and scenery of your route, when you can discover it for yourself? To me a large part of the appeal of wilderness tripping is the sense of exploration and discovery. When you reach a remote enough area, while you certainly aren’t the first person to travel that route, you can see it through that first traveler’s eyes. Knowing what is around every bend makes that feeling nearly impossible. Although this trip was fairly short and through an area that is fairly easy to access, it served as an affirmation of the above ideas. 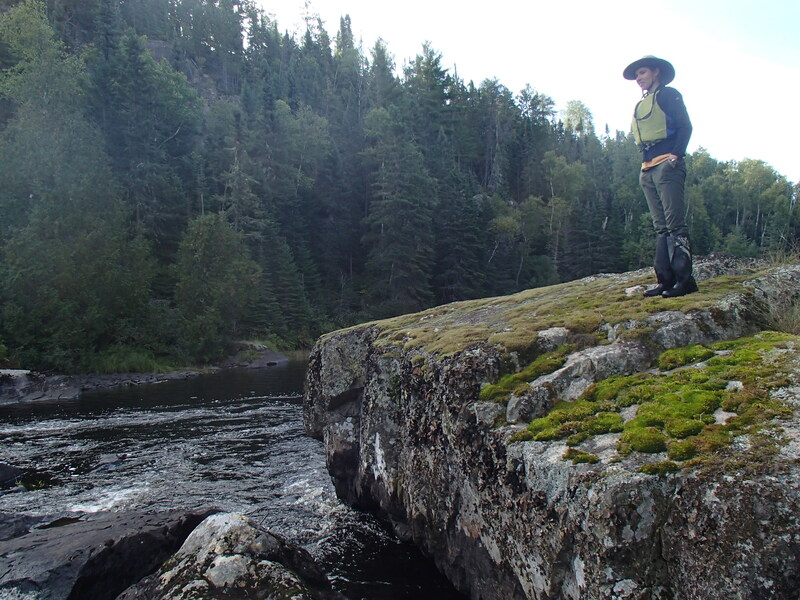 The river was totally different than I had imagined, and the landscape offered many surprises each day. The route was easily doable in the four days we had. We must thank Robert at Red Pine Outfitters for his advice, hospitality, and for facilitation our car shuttle. 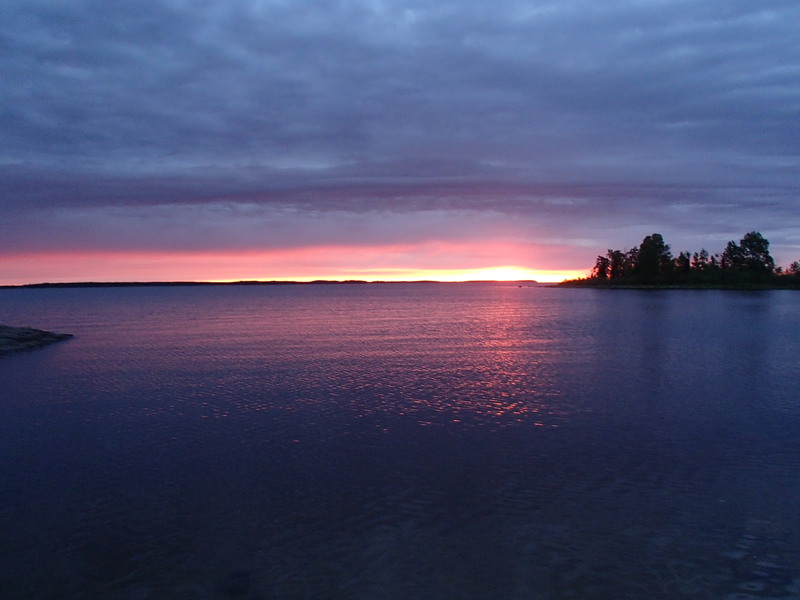 Starting out on Weikwabinonaw Lake. It was a classic shield country lake, filled with rocky points. 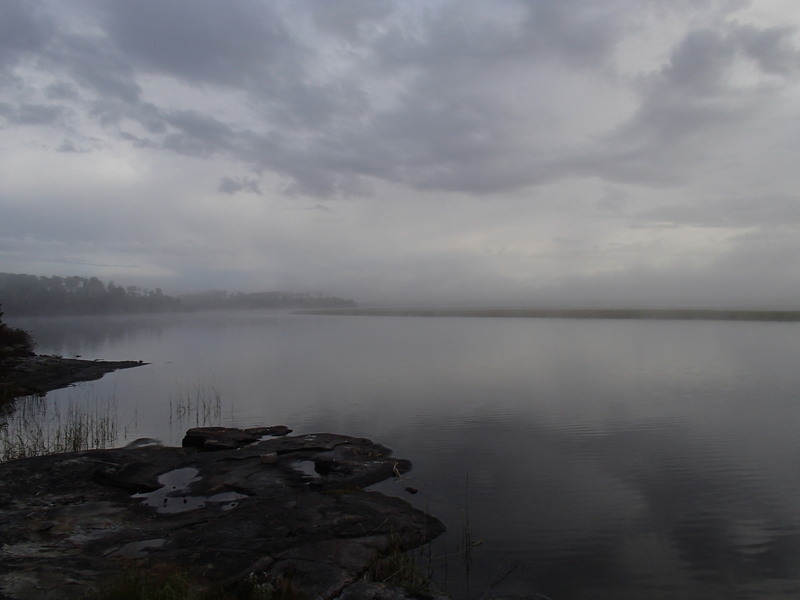 Looking up river, towards Jacob Lake. Lunch stop on our first day. 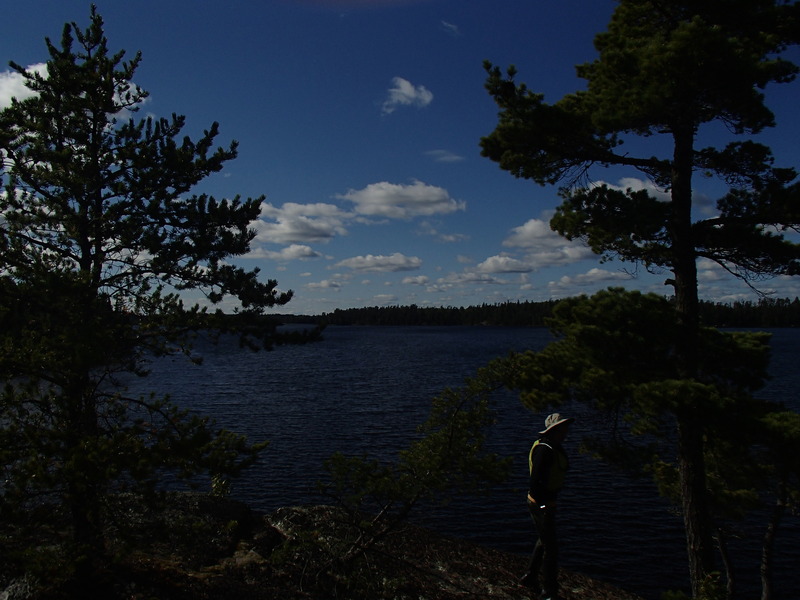 Checking out the area around our camp on Koss Lake. Day 2 started in a heavy fog. The start of a long rapids. With spring or even early summer water levels it would have been a fun and straight-forward run. It rained on and off for our second morning. A rough road crossed the river at a large rapids. 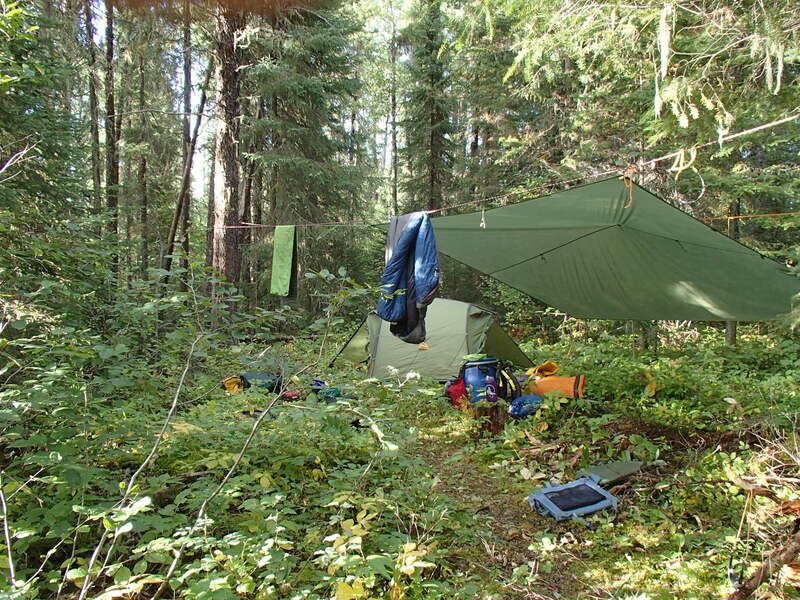 There was a nice established campsite on the portage. Looking at another larger set of rapids. Kate, waiting patiently for me to be done looking at the large set of rapids. 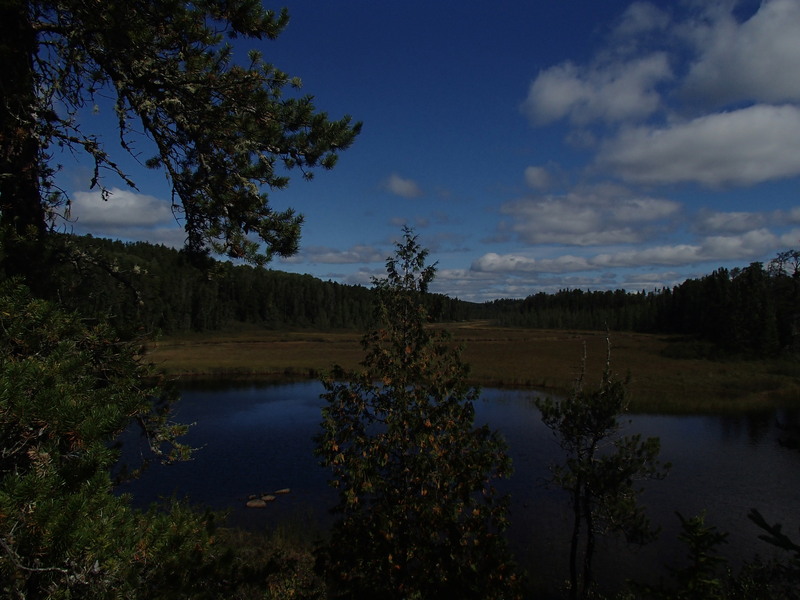 We found a very scenic site on a small lake that the river passed through. 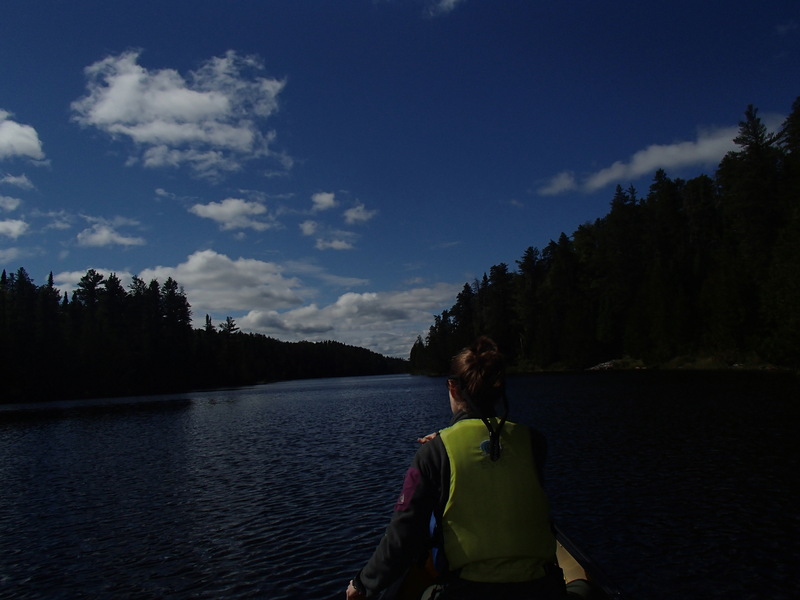 After determining that we would stop for the day, Kate paddled the canoe around to a better landing spot. Even at the “better landing”, the site was still difficult to access from the water. The last stretch of river was very scenic, with high rock faces and fast water. Popping out into Northern Light Lake. We fought a strong wind for the rest of the day. Lunch on Northern Light. 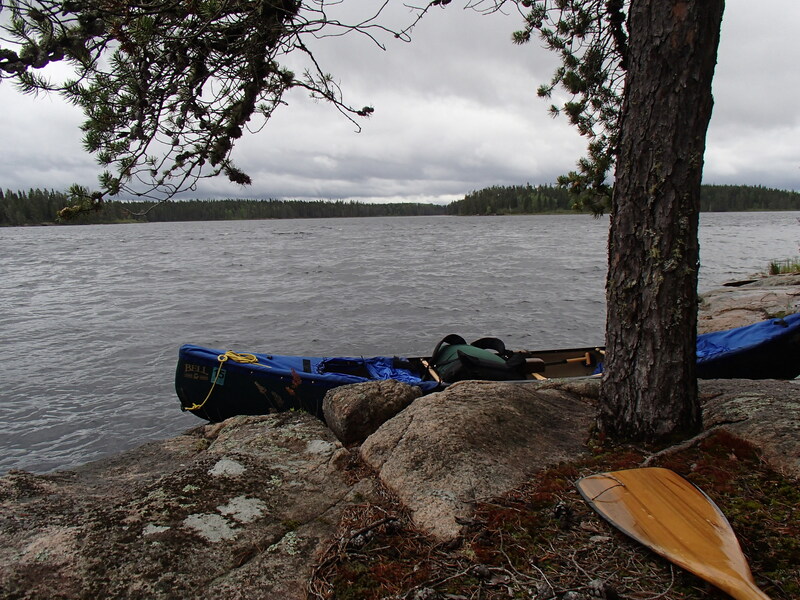 We later found a serviceable campsite within a couple hour paddle of our take-out point. 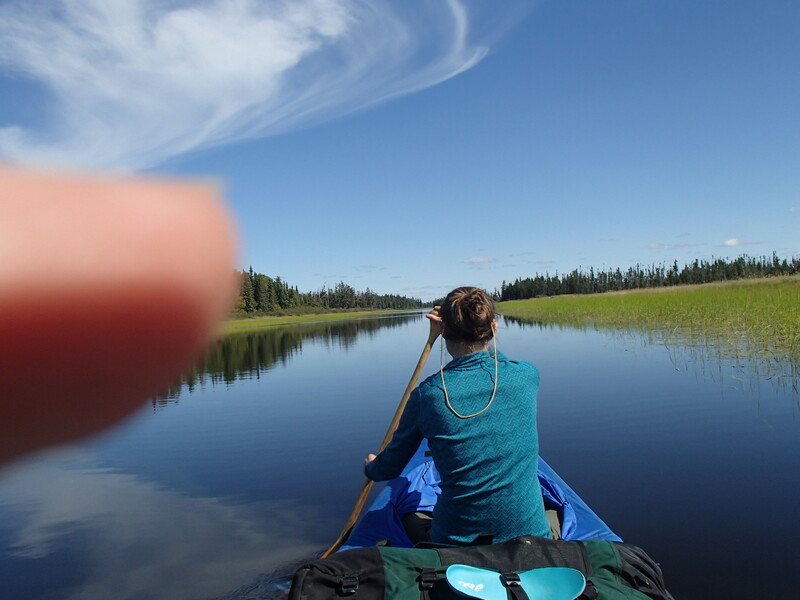 This year Kate and I returned to the Pickle Lake area for our June canoe trip. After last year’s trip, I assumed that there was never a rainy day around Pickle lake. Our weather was worse this year, as were the bugs. We drove to Pickle lake the day before, and stayed at the Lakeview Manor B&B, as we had the year before. Lynn from Lakeview took care of our vehicle shuttle. We set off early on our first day, hoping to get ahead of the wind. We were not so lucky and made our way down the lake in a light rain and a heavy wind. 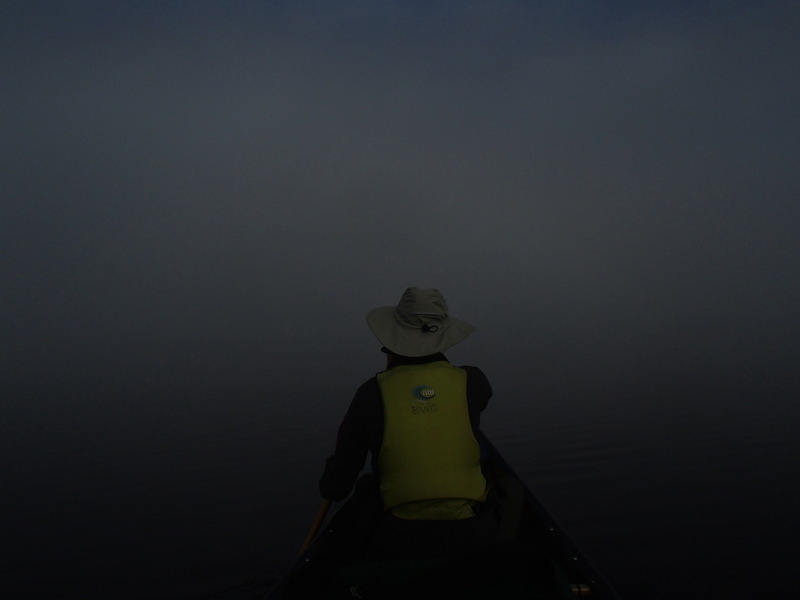 We had 50 miles of Lake St.Joe to paddle, and it seemed unlikely we would be able to avoid getting wind-bound. The wind was better once the lake jogged west, but still required our full attention. The lake itself was scenic and full of rock outcroppings. At 11:30 we came to a large section of lake that we could not safely cross in the wind. Luckily there was a nice place to camp. We warmed ourselves in our tent and killed time until dinner. No photos were taken the first day. Day two we woke up at 4 AM. The wind was already strong. We were able to make our first crossing and head down the lake. The waves were very large, but the spacing between them was large and predictable. Around 11 we again came to another crossing that we were not comfortable with considering the wind. 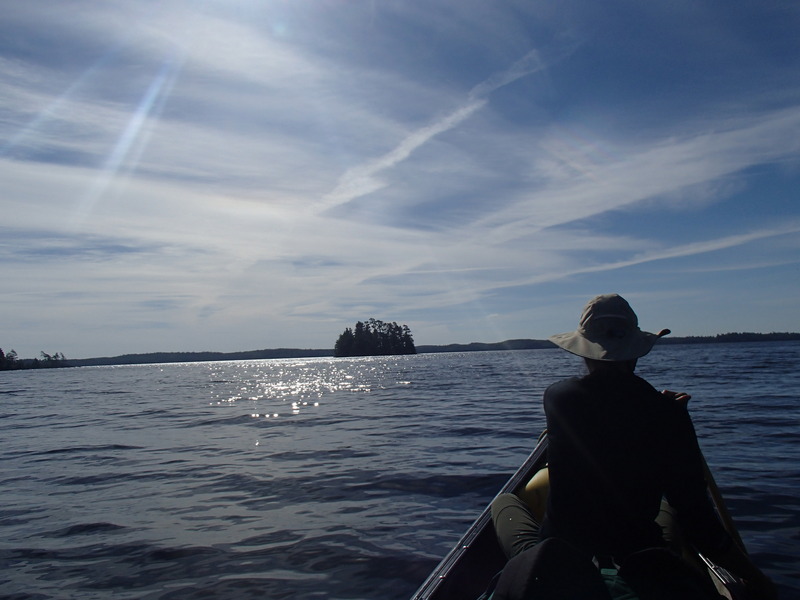 We decided to make our way into the bay and see if we could portage across the beginning of a large peninsula. The topo map had it marked as a wooded bog, so it seemed possible. Portaging wasn’t too bad, and it was nice to stretch our legs anyways. 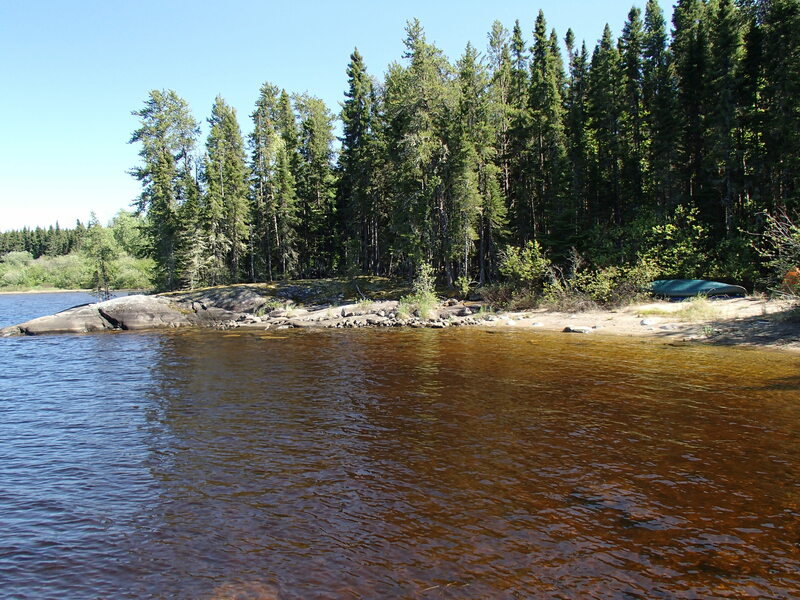 After our trip was over, I was amused to see a possible portage marked there in the Canoe Atlas of the Little North. After portaging, the wind seemed to die down, and the sun came out. We ate a nice long lunch on a sand beach. We continued down the lake, still in large waves, but in better spirits due to the sun. 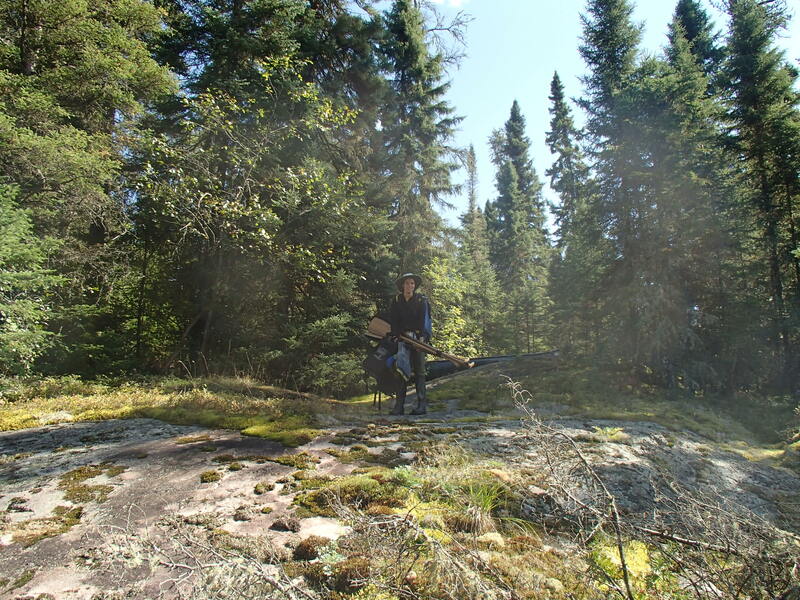 We made camp on a large rock outcropping right before the lake jogs south. Day three we again woke at 4 AM and paddled a large crossing. Once we begin heading west, we were treated to a light wind at our backs. We stopped after a few hours and ate breakfast on an island. The day was pleasant by the time we reached Johnston Bay. 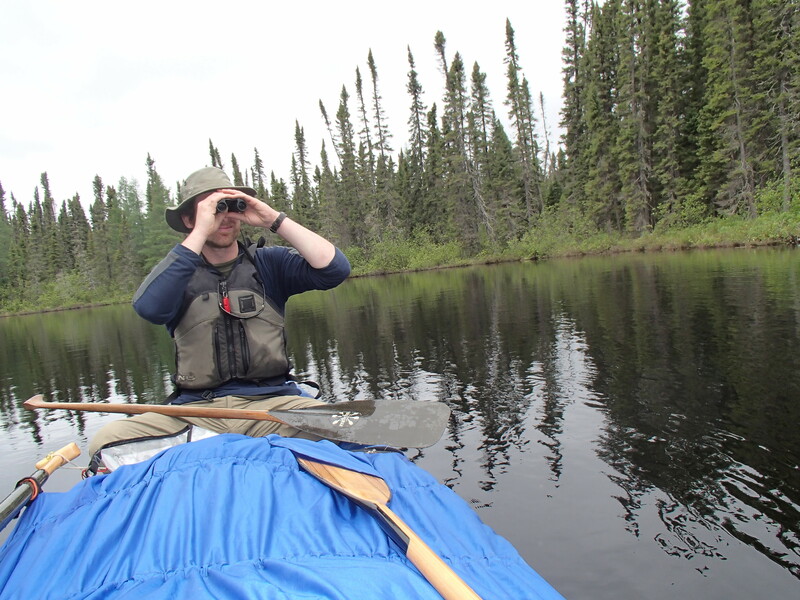 It took us a second to locate the entrance of the Cat River, but we were happy to be able to paddle right up the small swift at the mouth. We were greeted by the “Whale Rocks” referred to in the canoe atlas. By Blackstone lake there was on and off again light rain. The lake was very scenic, possibly my favorite of the trip. We met a party of motor boats from the fly-in camp on the lake, and shortly after set up camp on a very small site. Day four saw us get off Blackstone and do our first planned portage of the trip. 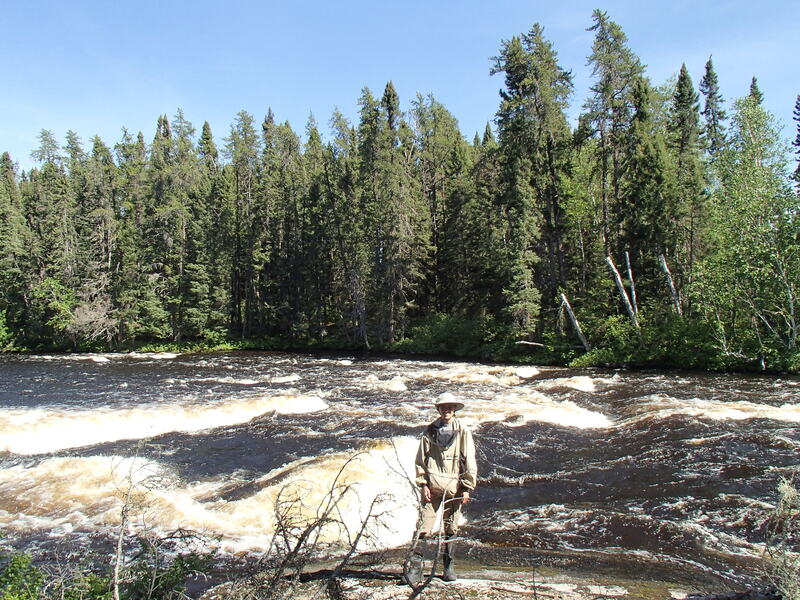 We were encouraged to find the portage in good shape. The rapids we carried the canoe around were full of water. At the next portage it got a little tricky. 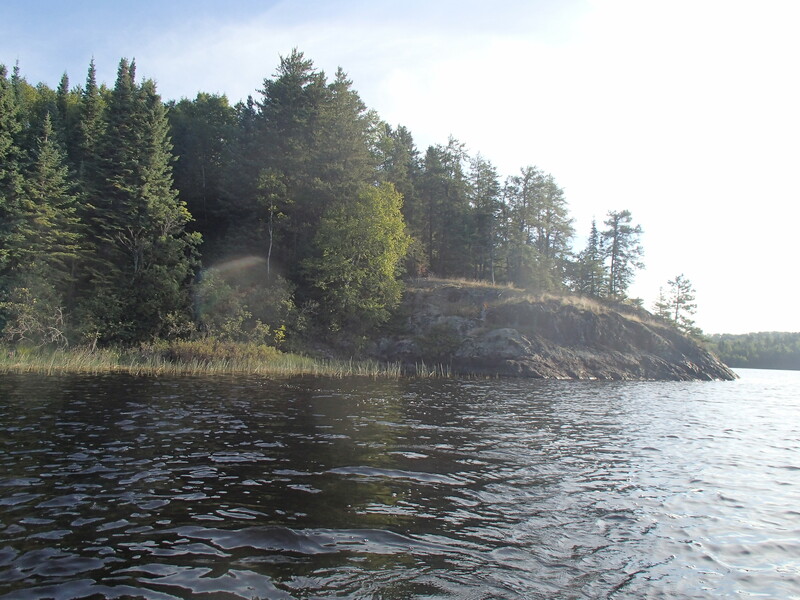 The portage was marked on an island, but we were unable to find it. The island was very narrow, and there just weren’t too many places the trail could have been hiding. The portage was around a series of rapids (we were heading upstream) and we were able to crash through the woods to the top of one set and paddle to the bottom of the other. Another trip through the woods saw us at the top of the next set looking to the third, which was around a separate small island. 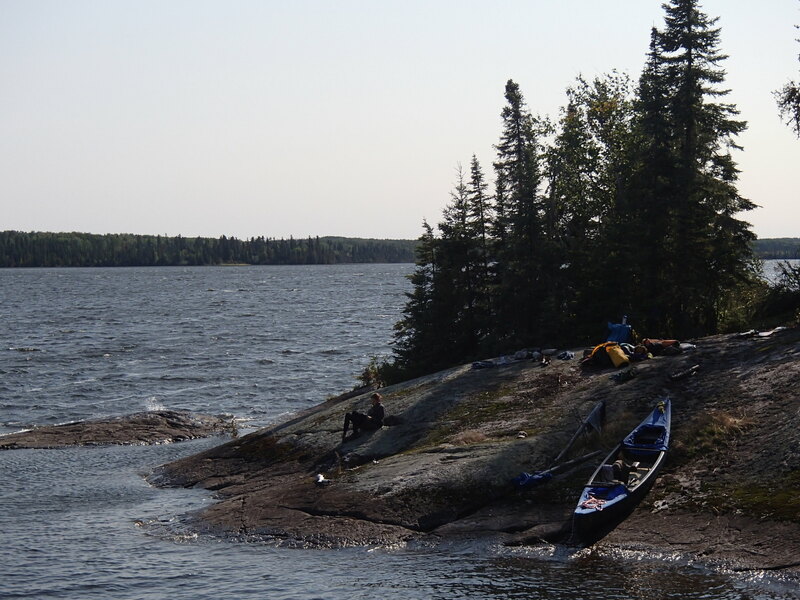 Some hard paddling put us on the small island, and we lined up the rapids and ate lunch. On our way to Roadhouse lake, and then Bamaji, we encountered a few more rapids, which may or may not have had portages around them, I can’t remember. The important part is that we got up them. By the time we were to Bamaji the wind had really picked up out of the east. We headed N.W. across Bamaji sheltered by islands, until the time came to make a wide open crossing straight west. We made a poor choice and had a wild ride, but safely made it to the opposite shore. 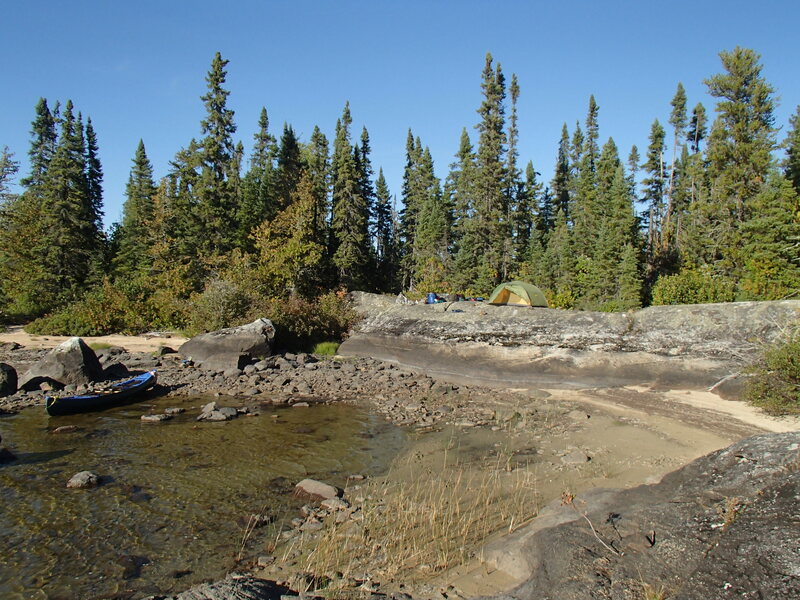 We paddled by a large fly in camp to a sheltered bay and made camp on a high rock. Soon after it started to rain heavily. The morning of day five it was still raining. We made breakfast under the tarp and headed out. The wind was strong out of the west, and made our crossing of N. Bamaji difficult. I found the south shore of N. Bamaji very scenic. As we paddled across the lake, a float plane headed to the Slate Falls community landed right over us. We were happy to find the first portage out of N. Bamaji. Once again, it was around a very full set of rapids. 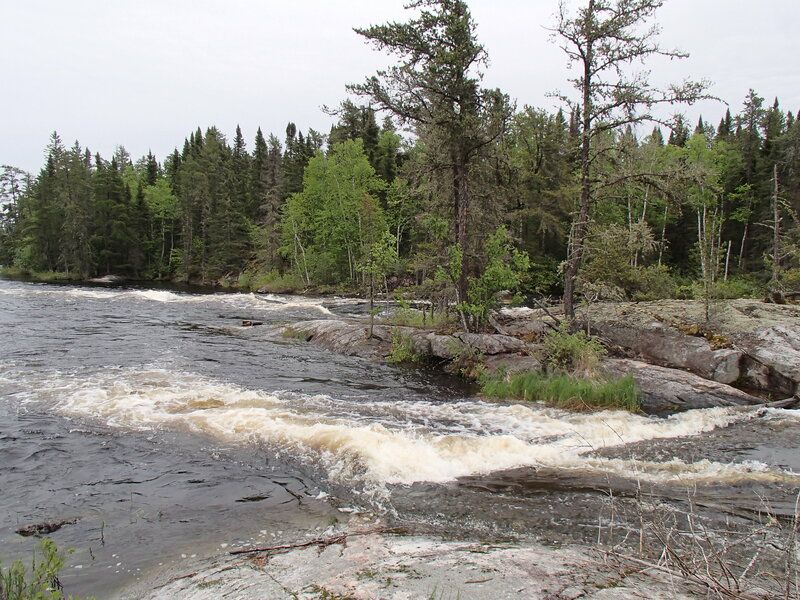 The next set of rapids was marked SLW, but we had to portage. Luckily there was an alright path. The last marked portage before Wesleyan lake may have existed, but the rapids seemed to be washed out, and some hard paddling got us to the top. Wesleyan was again a very scenic lake, with high rocks and islands. The going was slow against a strong wind. On the north shore we could see the run out of what must have been a very large rapids, but we just didn’t have it in us to fight the wind and go look at it. 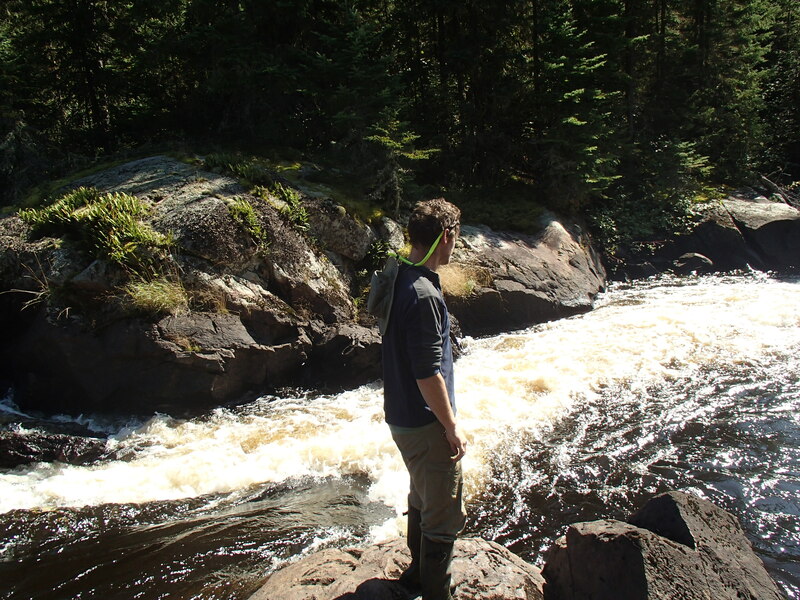 We arrived at the portage between Wesleyan and Kezik, known as the “Cat River Portage” and shown on my topo map. 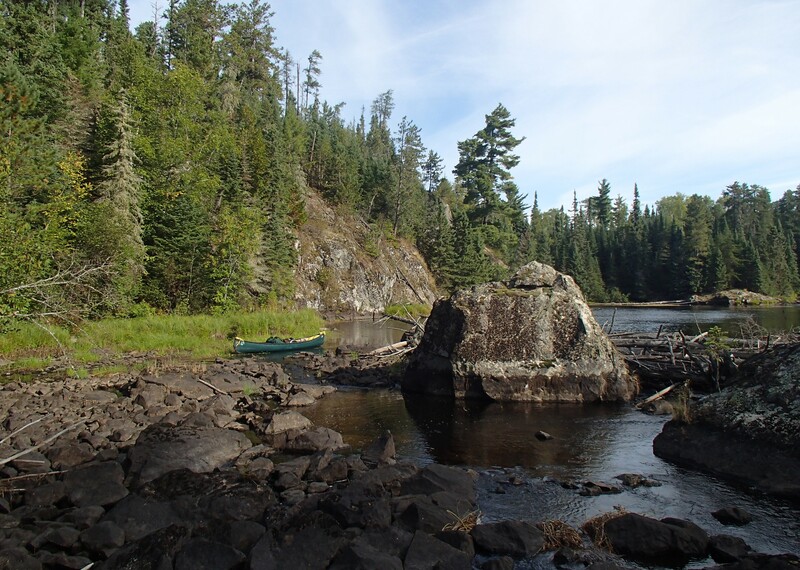 The portage had a lattice of logs constructed on it for dragging boats. It made walking much more difficult. On Kezik Lake we had a favorable wind. We ate lunch and than headed east for the first time. 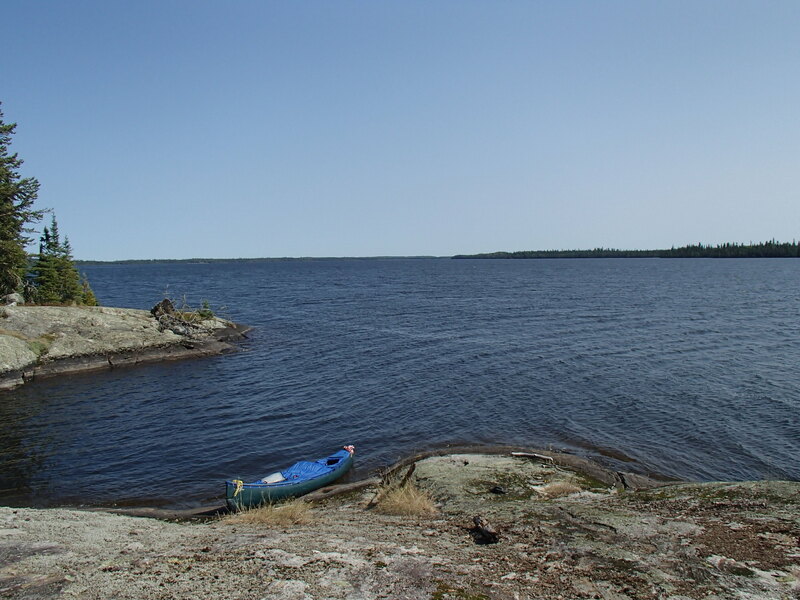 Kezik was a sprawling lake full of islands and narrow channels. 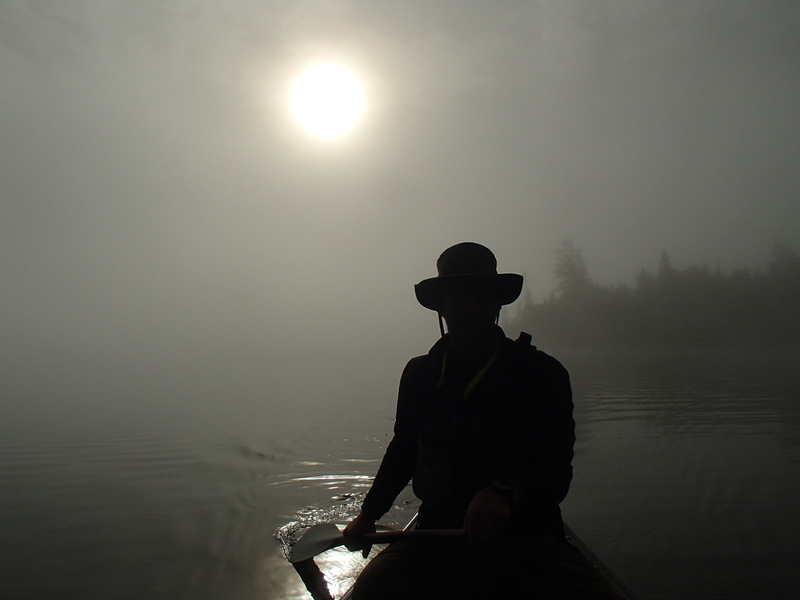 We paddled in a light mist. We came to the east end of Kezik a bit early to make camp. Our next section consisted of a very small creek, and I was unsure if we would be able to find a nice place to camp. We considered stopping early, but Kate leaned towards pushing on, so we did. The creek turned out to be one of my favorite parts of the trip. 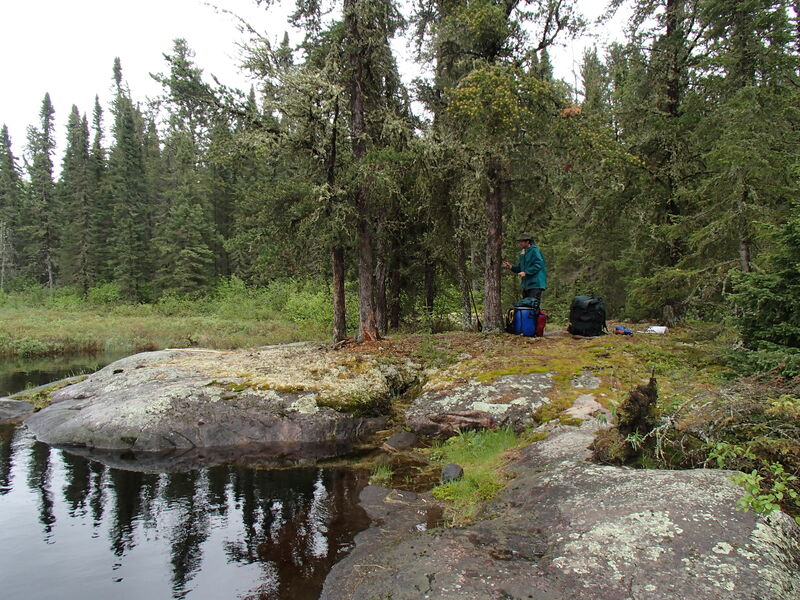 While I had though it might be swampy, it was generally it was high sided with small rock outcroppings. 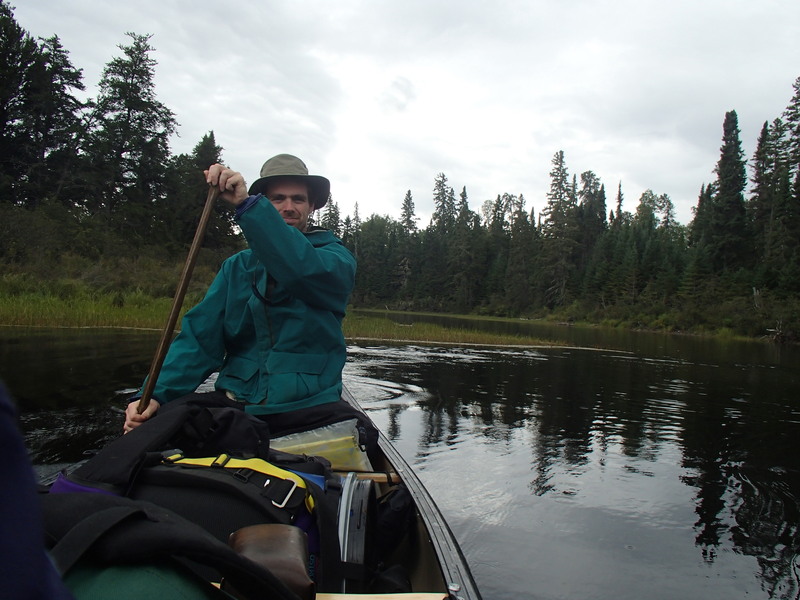 Paddling was easy, and a nice change of pace from the large lakes we’d been on. 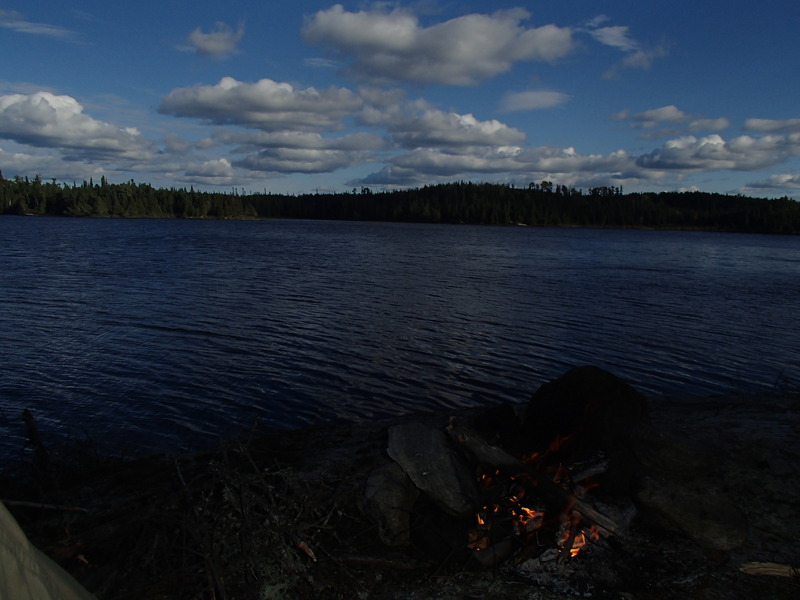 After around an hour we came to a great camp site on a small lake, next to a ledge filled rapids. 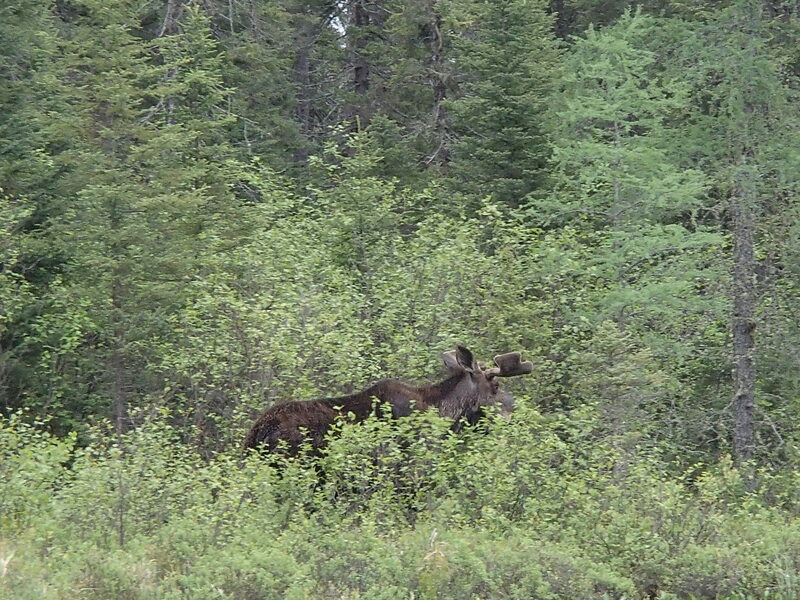 A moose swam across the lake in front of us as we inspected the side. As the evening went on, we were treated to our fist patch of blue sky since our second day. Day six was our last day of going up-stream. We broke camp and made our way up the creek, which was becoming narrower. 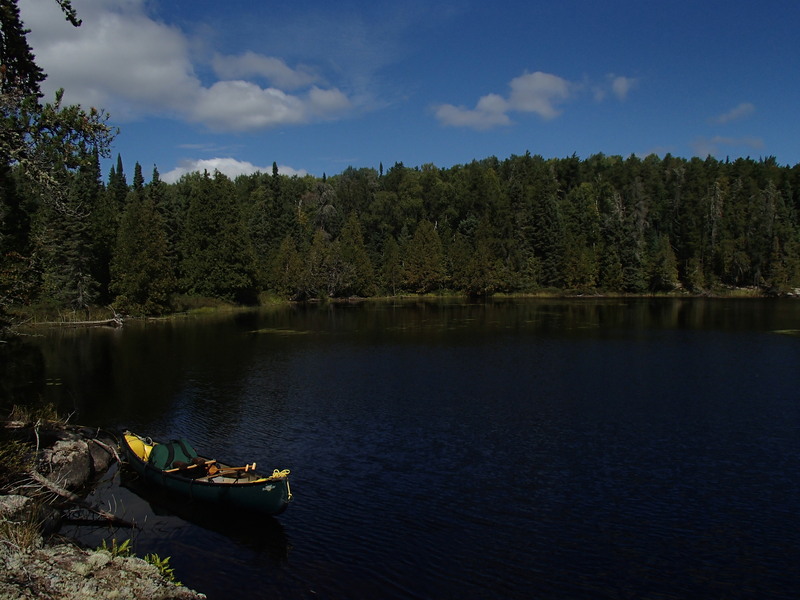 The 350 m portage into the last lake on the creek was easy to find and in good shape, which was an encouraging sign for the long portages to come. It took us a couple of passes to find to first of three long portages crossing the height of land into the Dobie river. 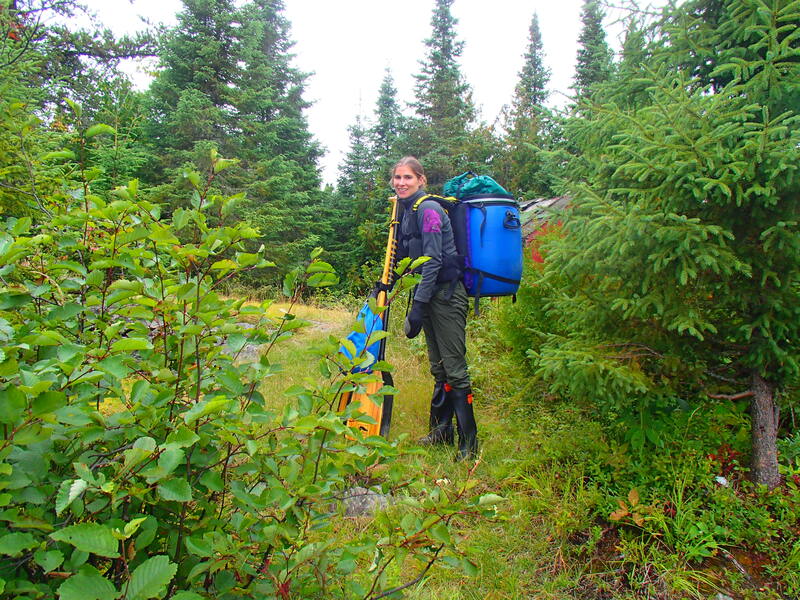 Once on it, the 700m portage was flagged with a good trail, until we hit a swamp where it disappeared. After much dragging, cursing, and despair, we made it out to a small channel with took us to the next lake. 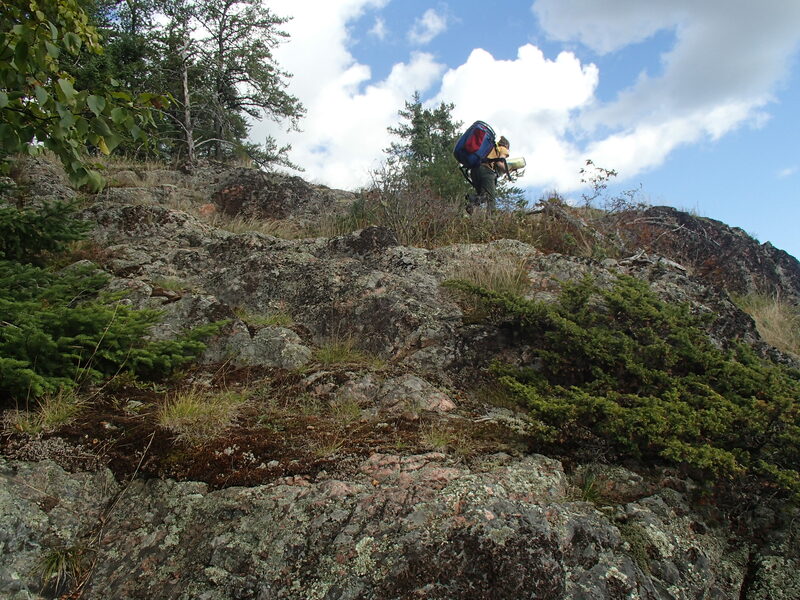 The next portage, 800m, was high and dry and marked with old blazes. 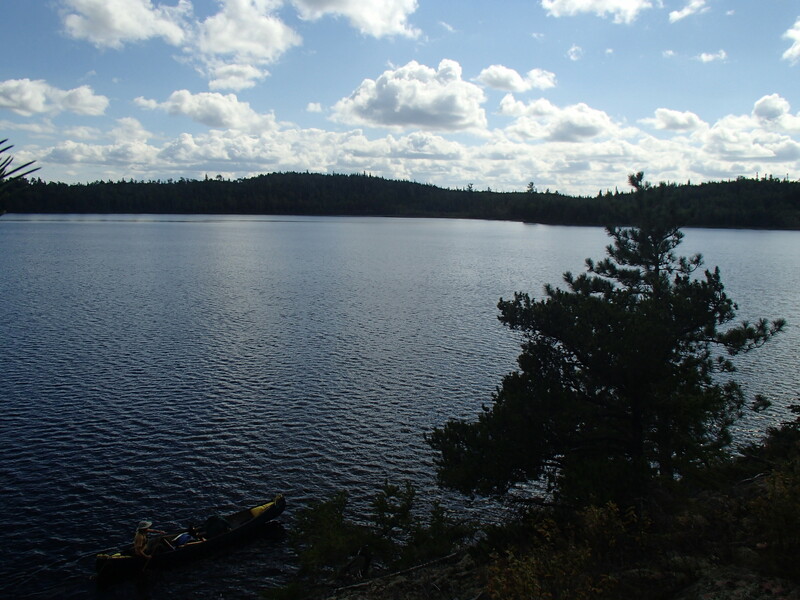 The last portage, marked 500m, was not apparent. 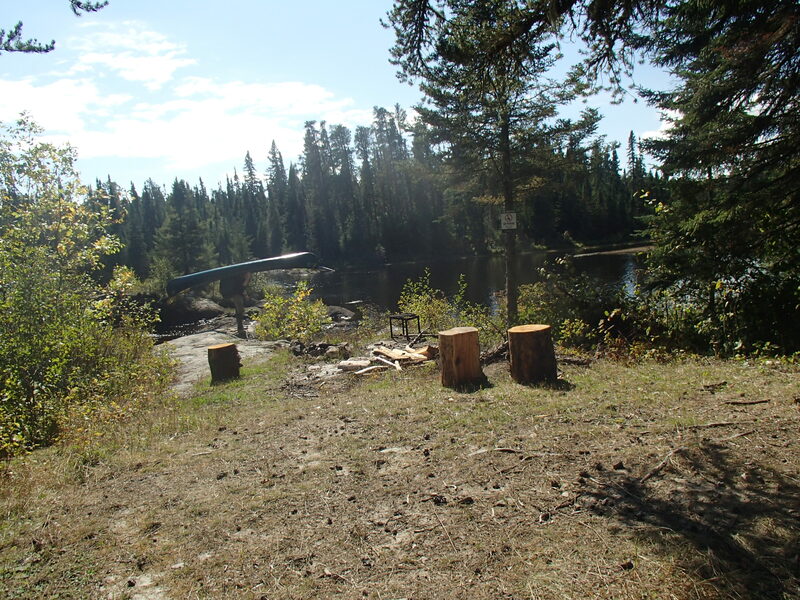 With a little scouting we were able to carry through a section of spruce forest and emerge at Dorothy Lake. On Dorothy we saw flagging at a likely spot to have replaced the missing 500m port, and wondered if maybe our information was out of date (we were not using the route to the Dobie shown in the canoe atlas, but instead a route apparently used by Camp Wabun). We crossed Dorothy lake and finally were on the Dobie. The Dobie is small at this point, but with steady current. We ran some small riffles and had to lift over a log. Shortly after passing the Winter Rd we came to a large drop that we lined. We portaged river left around a long rapids well on its way to becoming a log jam. 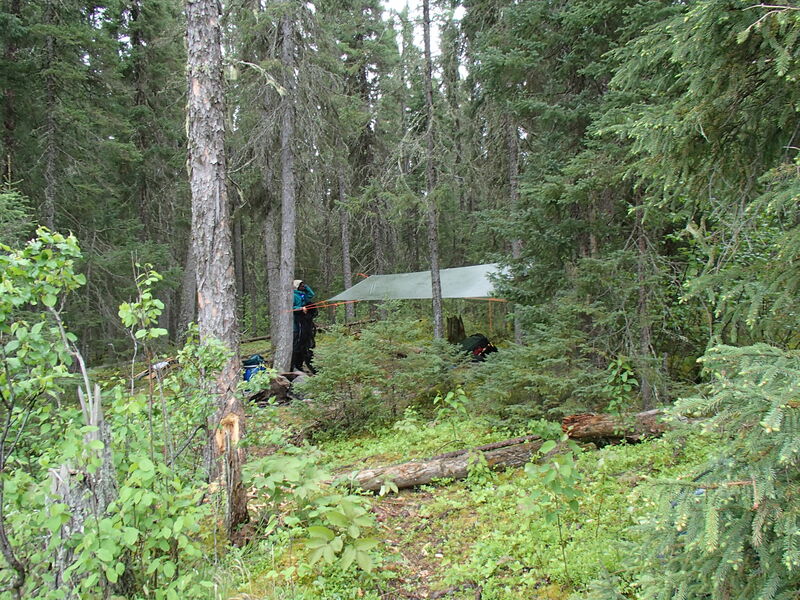 We made camp just above a small lake at a nice but unspectacular site. On day seven we woke up to blue skies. It would be our first full day of good weather. 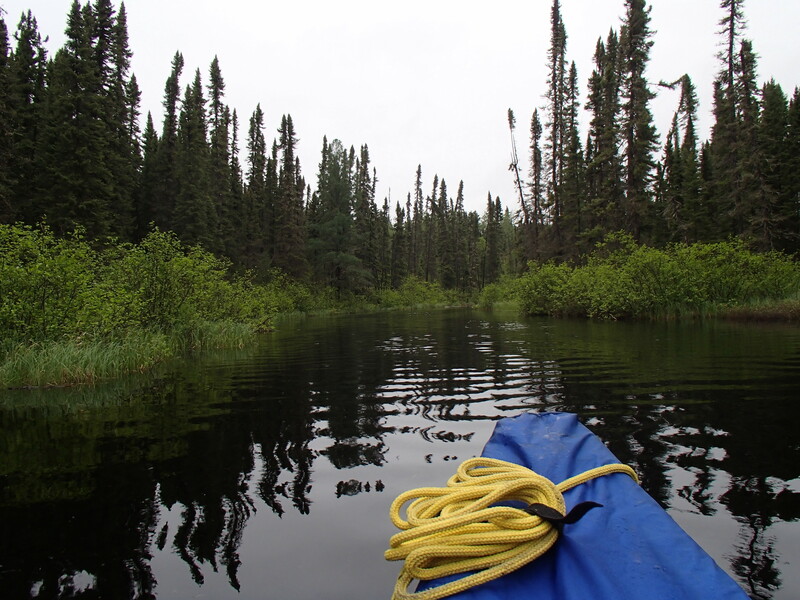 We paddled across the small unnamed lake and then made our way down a long shallow set of rapids, often wading. On the next lake we paddled east into a strong wind. We took a 750m portage into Dobie lake. The port was in great shape, probably maintained by the fly in camp on the lake. We paddled Dobie, and ate lunch half-way down on an island. We ran two sets of rapids, one large that required some eddy scouting, and one straight forward set. We paddled a small lake, and then Hergott Lake. After Hergott we found a small area we could camp at. 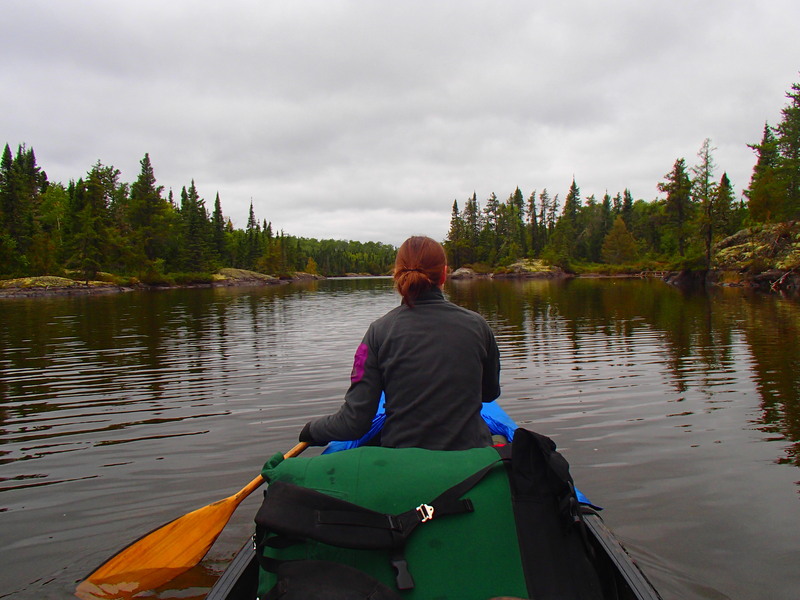 We decided to paddle another little ways and see if there was better camping at the next portage. 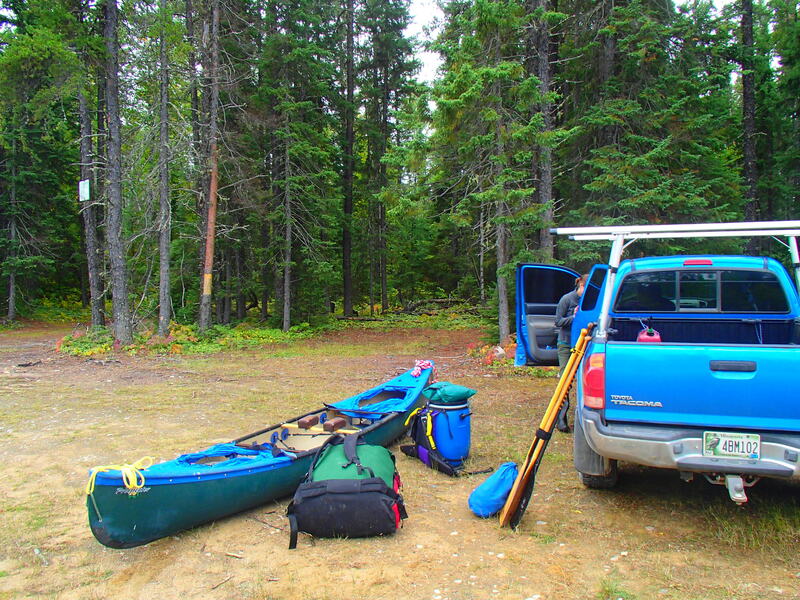 I had the portage on the left, but we eventually found it on the right. The rapids were impressive, but there was no good place to camp. We returned to the first site and made camp. 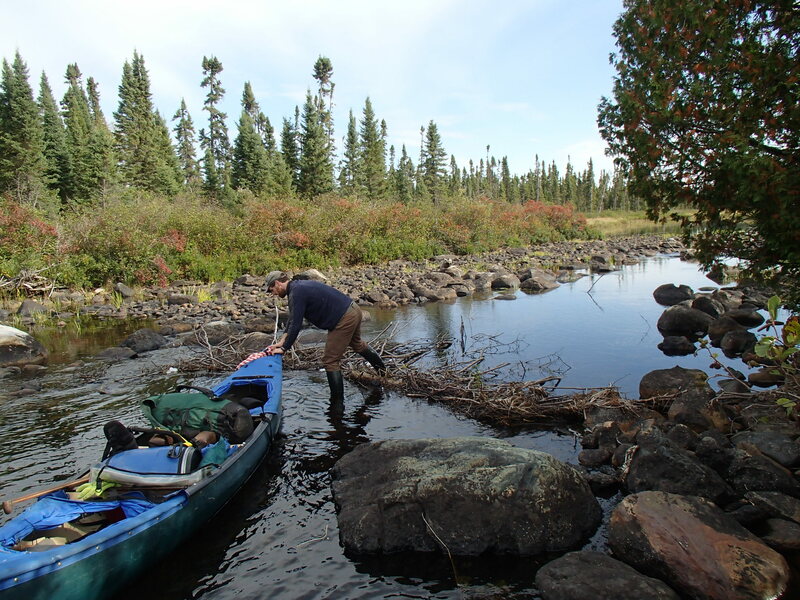 Day eight started with a short paddle and the portage we had found the day before. We padded until another large rapids, which we ran left. We took on some water at a small ledge. 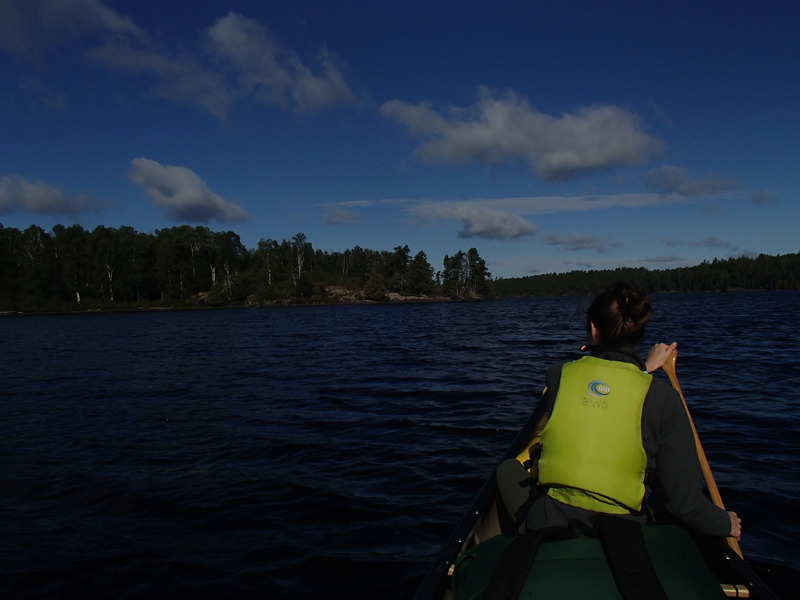 As we paddled across Lecky lake, the wind shifted to behind us. We ran a few easy riffles and ended up in Nanos lake, where the wind was no longer favorable. We ate lunch at Nanos. 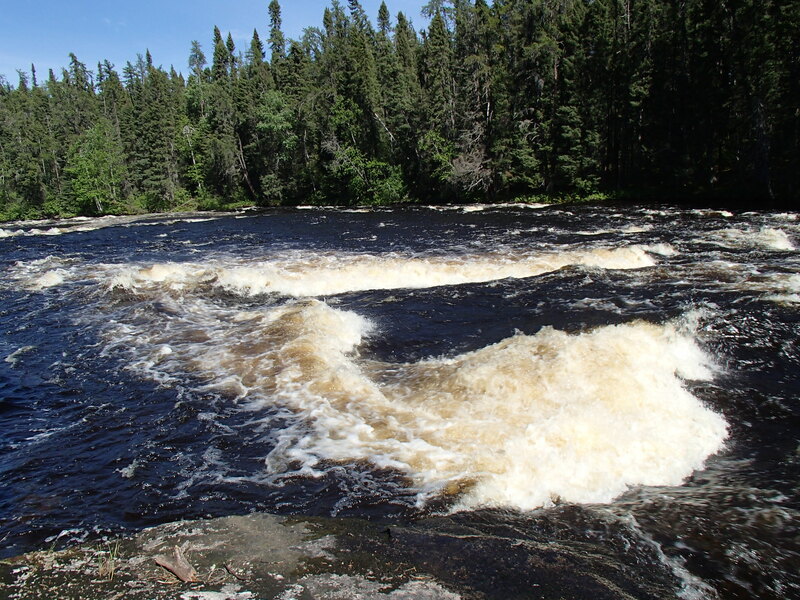 After Nanos we ran a couple SLWs and took a 600m portage around a powerful set of rapids. We ran a few bigger rapids, eddy scouting on the way down. We came to a rapids that Lynn had told us to be cautious of, where the Dobie makes a hairpin turn during a steep drop. We ran the top, working from eddy to eddy. 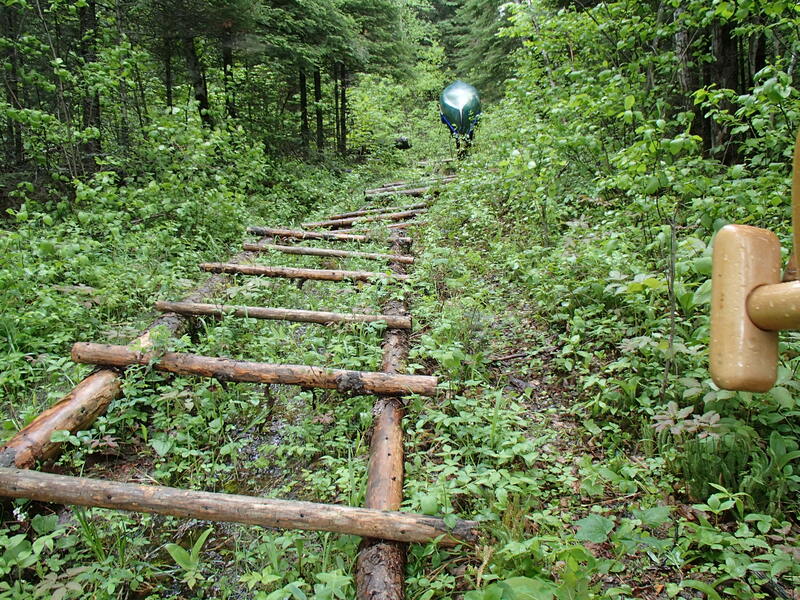 After awhile we found a portage trail in an eddy. Below us we noticed a slopping rock campsite, with small eddy above it. 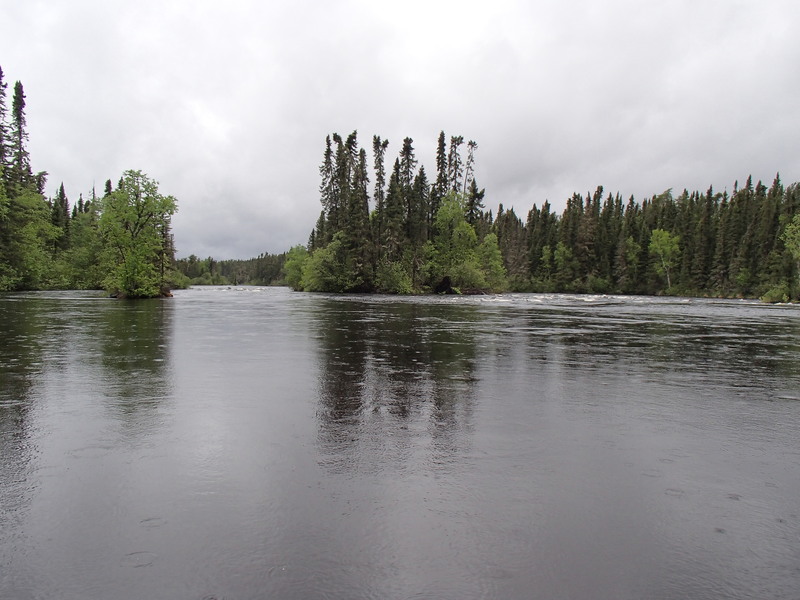 We elected to portage to it, since missing the eddy would have had a high consequence. 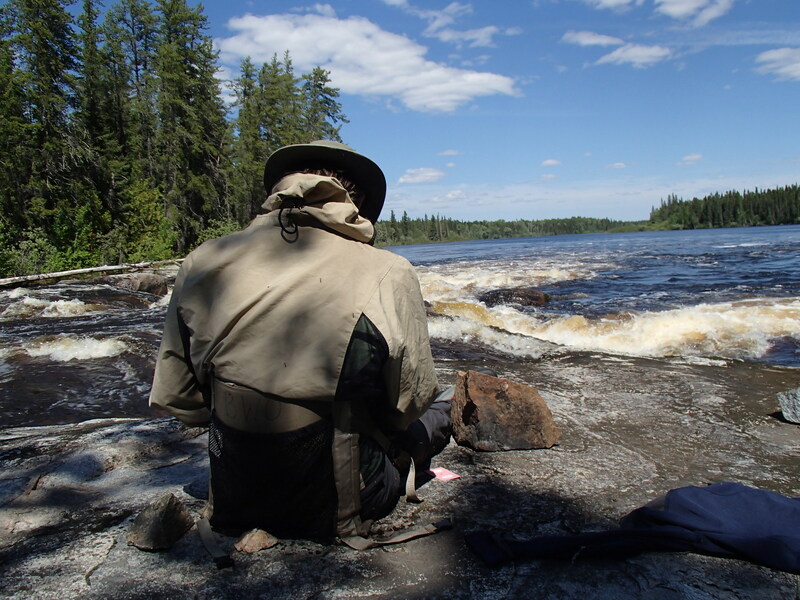 The site needed a little work, but sat at the edge of a massive section of the rapids. The water was deafening. 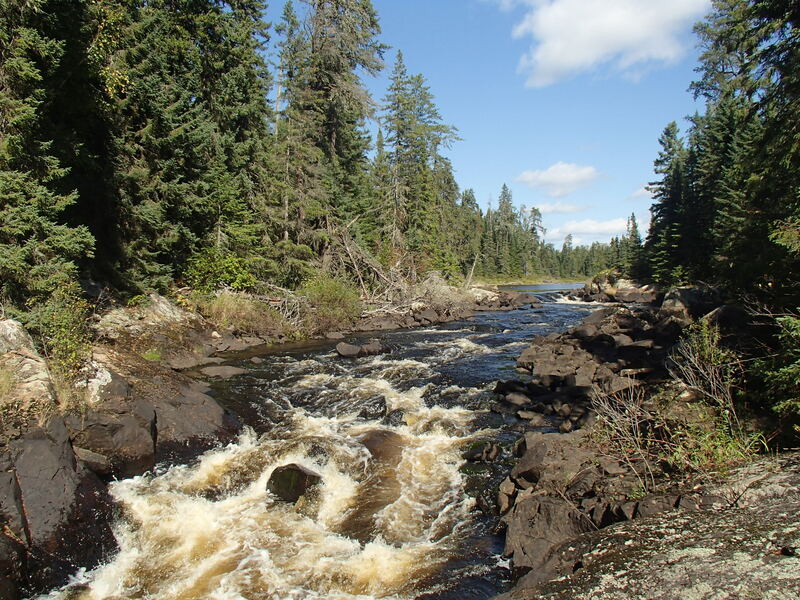 Day nine started with a long portage around the remaining rapids. It had rained all night, and the bugs were very bad. 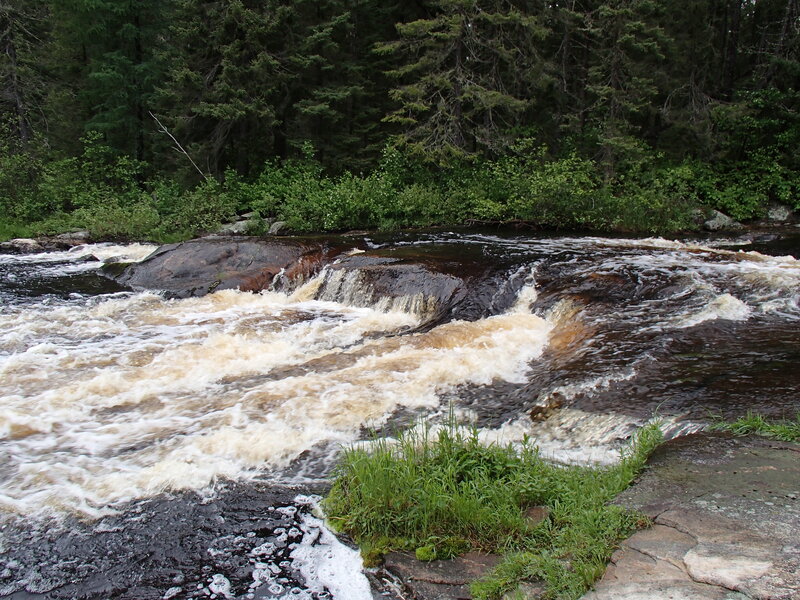 The remaining rapids on the Dobie were mostly easy straight shots. We entered the Otoskwin below Froats lake. Since we had paddled this stretch last year, it was interesting to compare water levels. The rapids this year seemed pushier and more confused. It rained most of the day. We were happy to take the long portage around the rapids above Bow lake, just to stretch our legs. 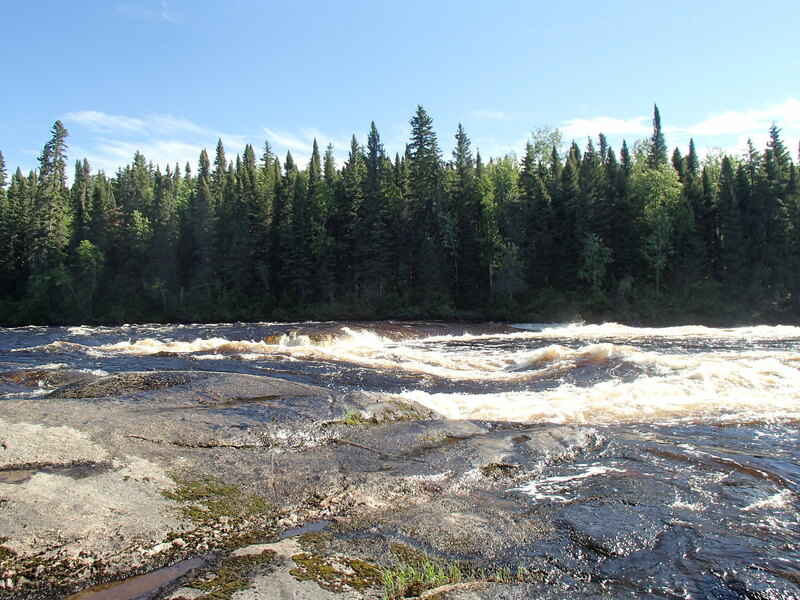 Last year we had run and lined them, and I’m glad we did as there was no good view of the rapids or the campsite at their bottom from the portage. 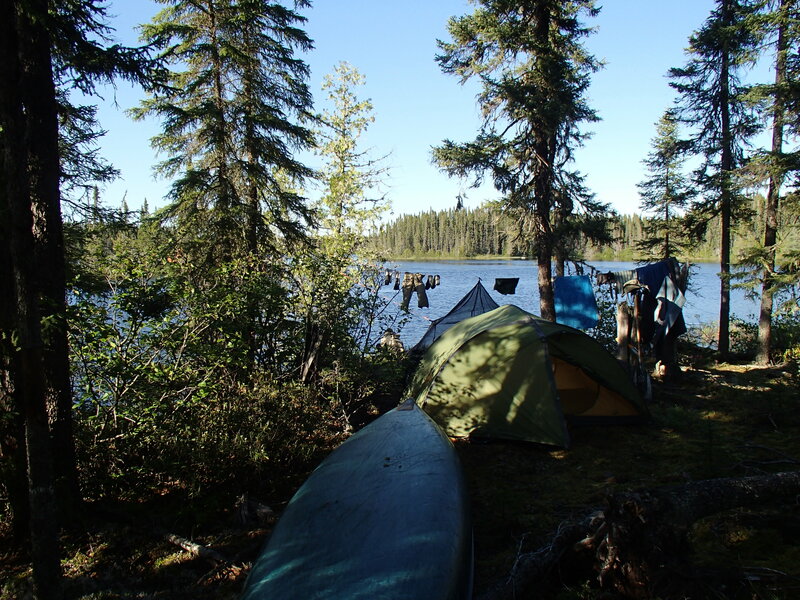 We paddled Bow lake and them made camp on the portage around a big set of rapids. Last year we had arrived at this site mid-day and thought how nice it would be to camp there, so it was nice that it worked out this trip. It rained on and off through out the evening, and the bugs keep us inside our bug shelter. Day ten was a beautiful sunny day. We ran the bottom of the rapids we were camped on, and continued towards Mud lake. The current was strong, and we made good time. We arrived at our last campsite from last year around 11:30. We knew that it would take nearly a half day to make it to our take-out, so we decided to camp and have a short day our last day. The bugs were bad, but a breeze kept them in check. On day eleven it was overcast, but not raining. 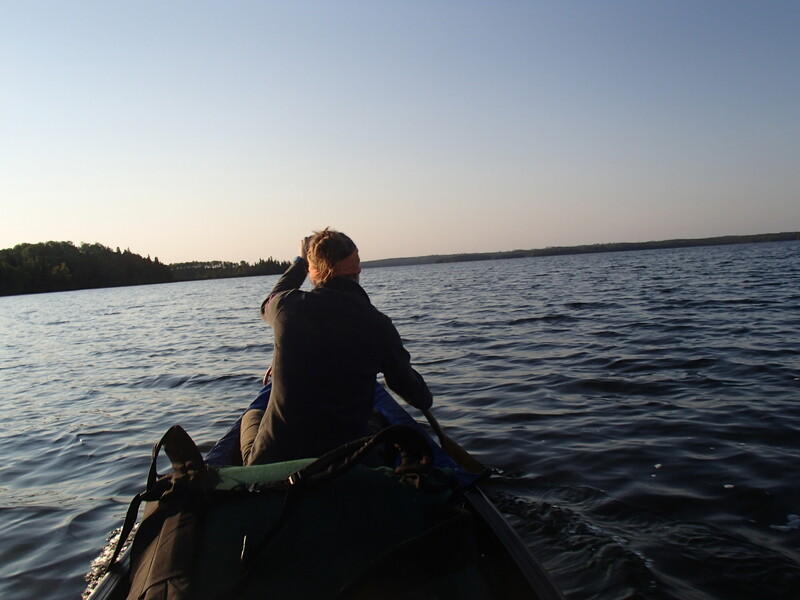 We paddled the last of the Otoskwin to Mud lake and made it to the take-out. We drove about halfway home, and stopped in Upsala for the night. 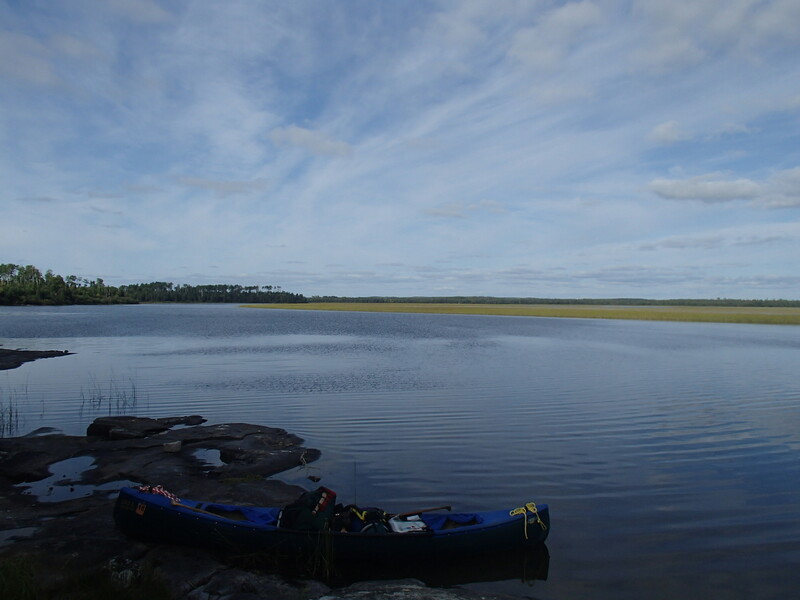 This trip presented many challenges, from Lake St Joe to missing portages to unbelievable bugs and hard rapids, but on day eleven I would have happily just kept going down the Otoskwin. 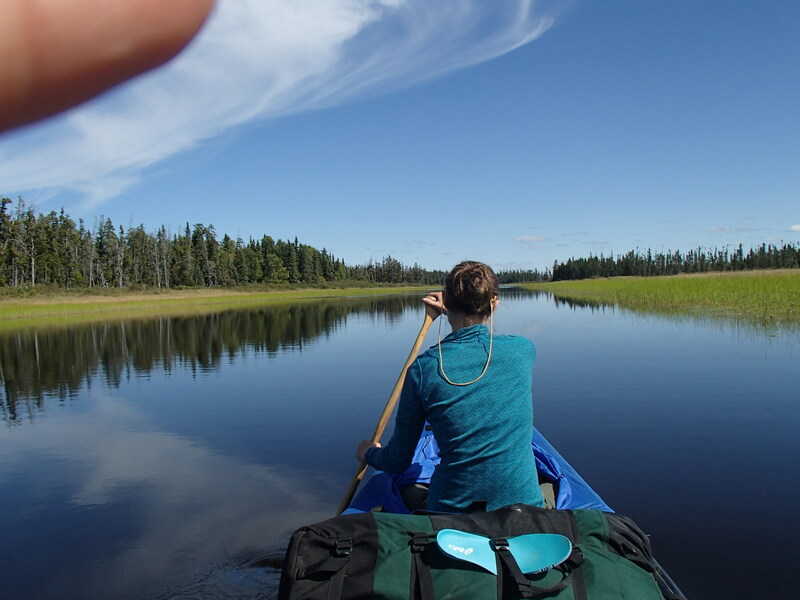 We paddled a little bit of everything, giant lakes to tiny creeks, and saw a pronounced difference in the landscape after crossing the height of land. The total trip ended up at 11 days and about 210 miles, plus around 16 hours driving.